My cycling career started in a more serious fashion in 1997 as I joined a local cycling club called Pyörä-68. I had been primarily inspired by watching pro cycling on Eurosport since 1993, when the Tour de France was dominated by the legendary Miguel Indurain. In addition to him, Tony Rominger impressed me thoroughly. True gentlemen, the both of them. After a couple of years of systematic training I was far from happy about my results, and realized I just simply did not have enough strength and speed. My life started to change in the 2000's but I didn't stop cycling. 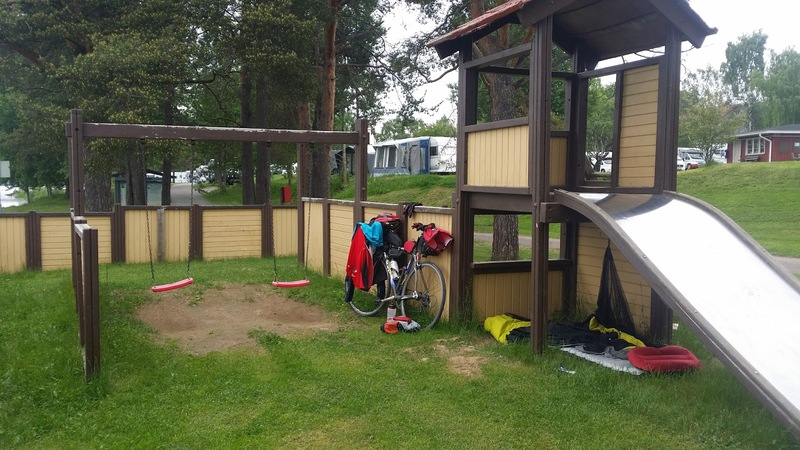 Instead I started to go for longer distances and mountain biking, where I got into 24h solo racing. Fast forward to the 2010's, I got interested by bikepacking and winter cycling as fatbikes became available. Winter races seemed to suit me quite well, as I came close to winning the Rovaniemi 150 in 2014. The next year I became the first Finn to take part in the Iditarod Trail Invitational in Alaska on the 350 mile course. The ITI has remained the peak of my career so far. On that same year, 2015, I also took part in the Levi24 race, where I fought my way through to finish second, despite having a slight flue. However my mind was searching for a new challenge for the following summer. At the same time the idea of returning to road cycling emerged. The 24 hour race concept is great, but after experiencing it on several occasions I saw no reason to do the same on a road bike, which ruled out, for instance, a race called Ratareisi. 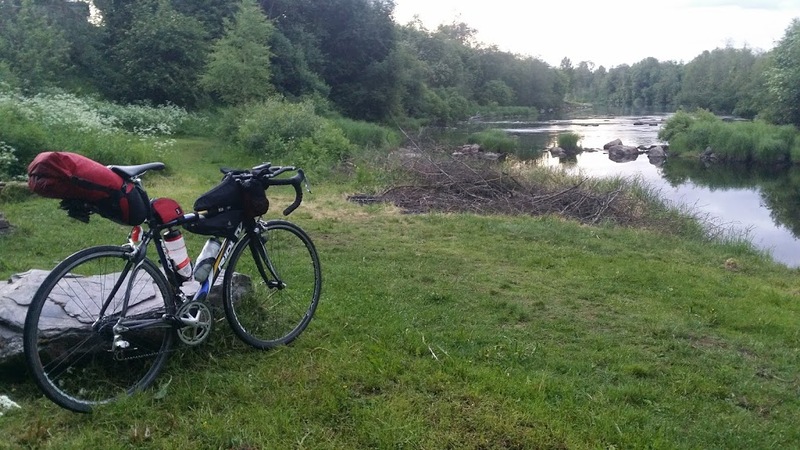 24 hours on a road bike would be so easy it couldn't really surprise or move me that much. 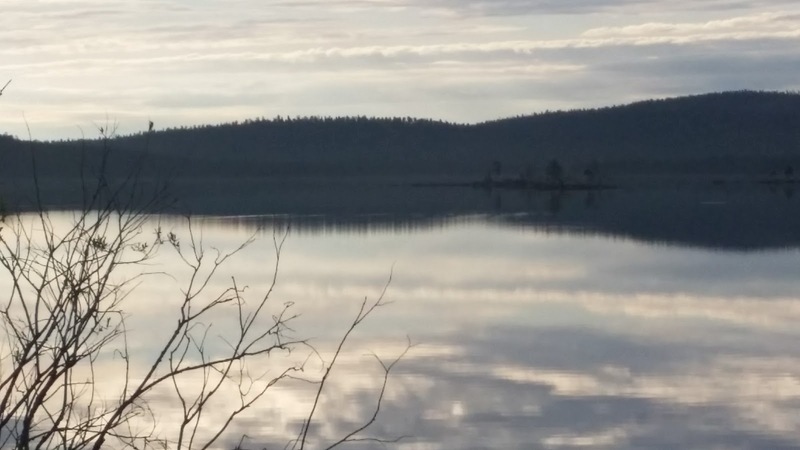 In general, after the ITI all Finnish races seemed a tad too easy, apart from the Mammuttimarssi (Mammoth march) which is nowadays called Synkkä syysunelma (a grim autumn dream). 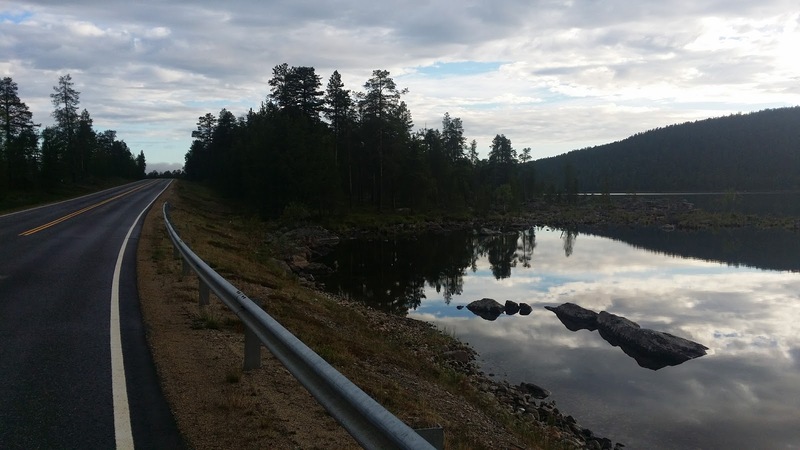 My initial plan for summer 2016 was a 1000 km ride from Turku to Levi, with a support car. Figuring out the logistics and resources turned out to be too laboursome, and the ride would have been too much about just getting it done. During the 2010's my riding has been much more about adventure. And so I gravitated towards a plan of a bikepacking ride through the entire country of Finland, completely unsupported. 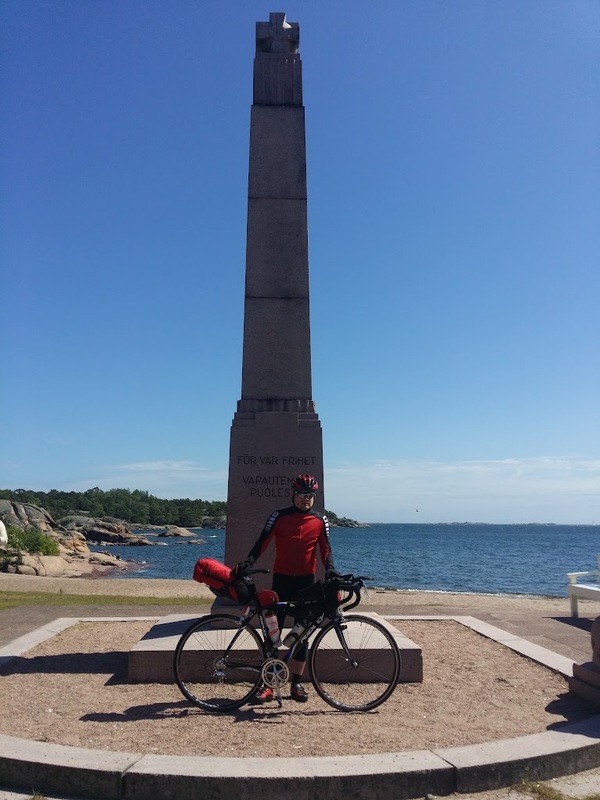 The self-evident starting point would be the Statue of freedom at the southernmost point of Hanko, and my finish line would be the Finnish-Norwegian border at Nuorgam. 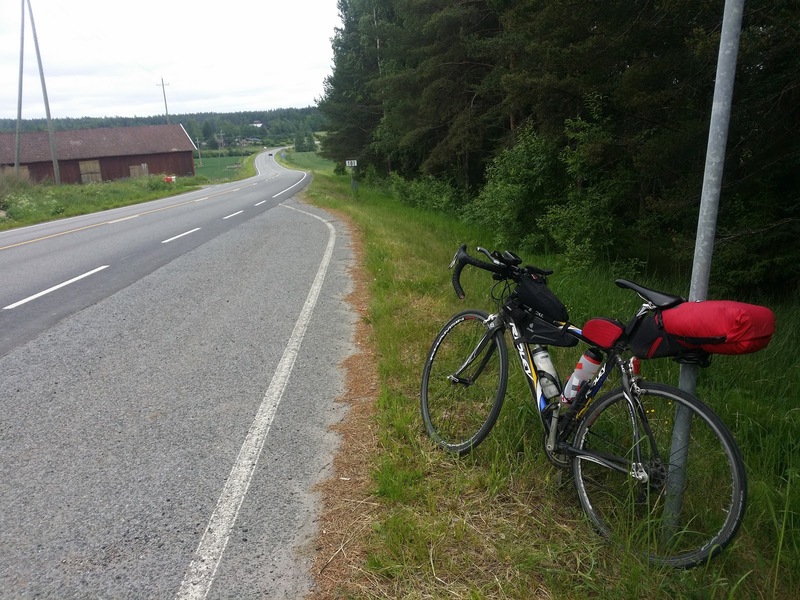 Depeding on the roads chosen I would ride between 1440 and 1500 km. 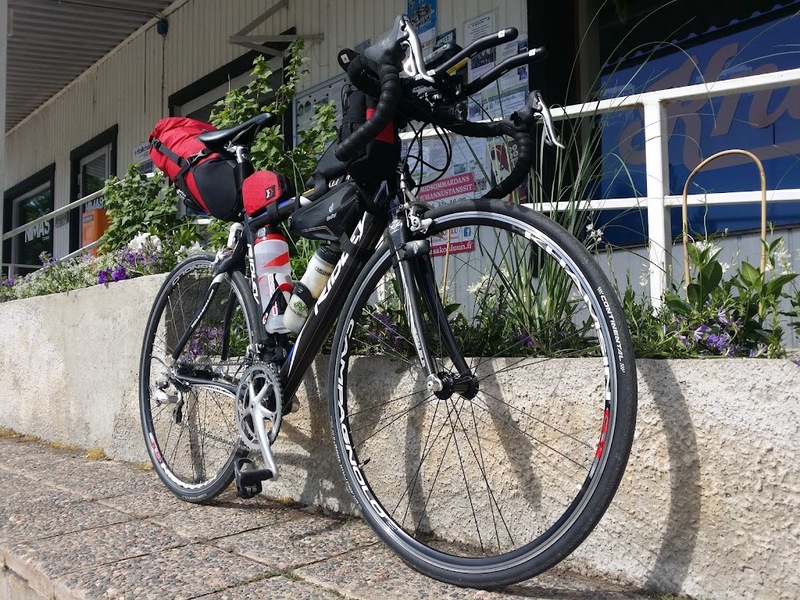 I got my inspiration for this trip by the numerous brevets, randonneur and audax events and the ultra distance road races that have been born out of these shorter races, such as the Transcontinental Race in Europe and the Trans Am Bike Race in the United states. 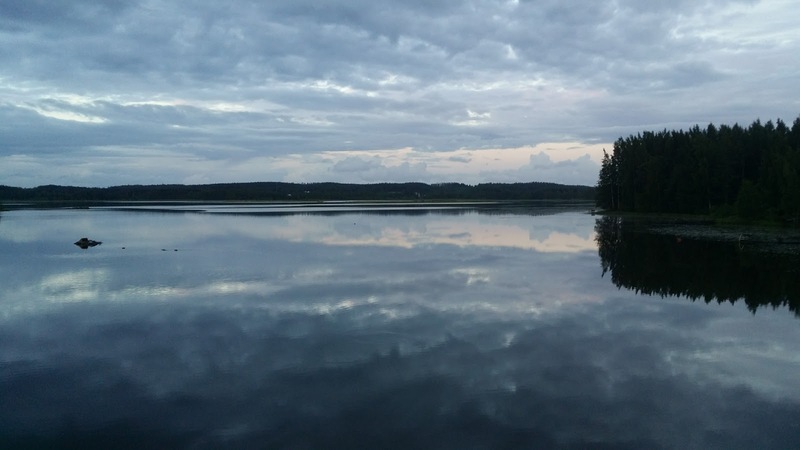 Trans Finlandia had been in my mind, in one form or another, for quite long. 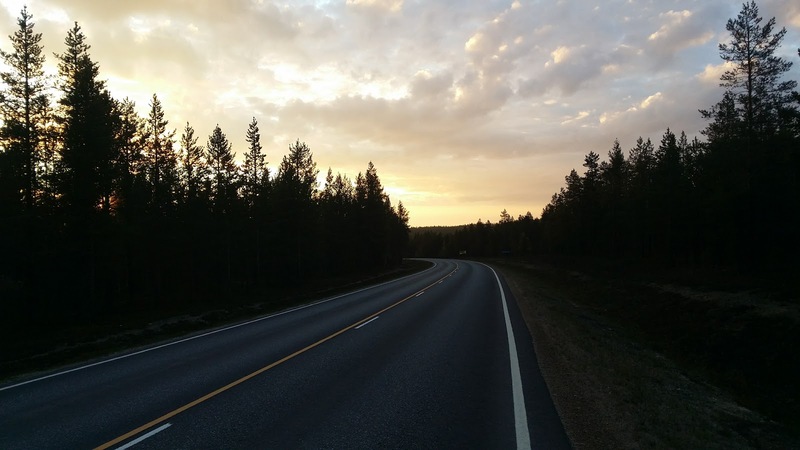 I set myself a somewhat ambitious goal: I wanted to ride Trans Finlandia in 4 – 5 days and nights. As months passed by, this started to look like a tough task, as I had only gathered 3200 kilometers before setting off. In addition the past year had been grim: Mike Hall, a true legend of this genre of cycling, had been killed in March while riding the Indian Pacific Wheel Race, struck by a car. Bad news piled up as Eric Fishbein was also killed by a motorist in the Trans Am Bike Race. 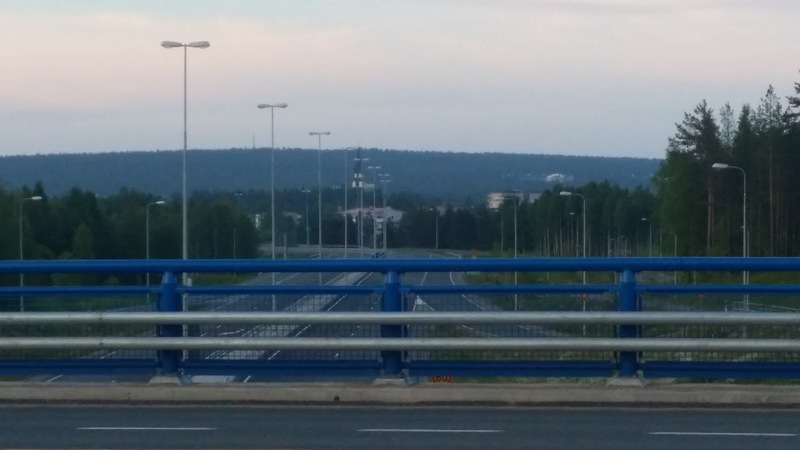 News about what was going on in Finnish traffic was not inspiring, either. It was clear this would be the most dangerous ride thus far. One problem with a long ride is that a couple of Euros won't take you all the way. I, however, wanted to keep costs down as next winter's ITI is my main goal. 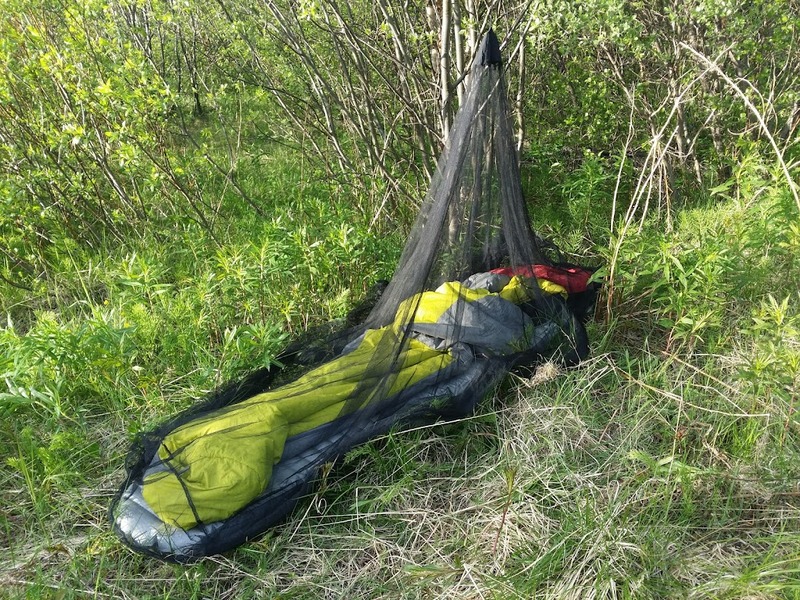 I wouldn't have to pay for accommodation, as I would quite naturally sleep out every night with a bug net, sleeping pad, sleeping bag and pillow. If it rained during the night, I would try to find a basic form of shelter such as a barn, bus stop or something. But traveling back home would inevitably cost something. 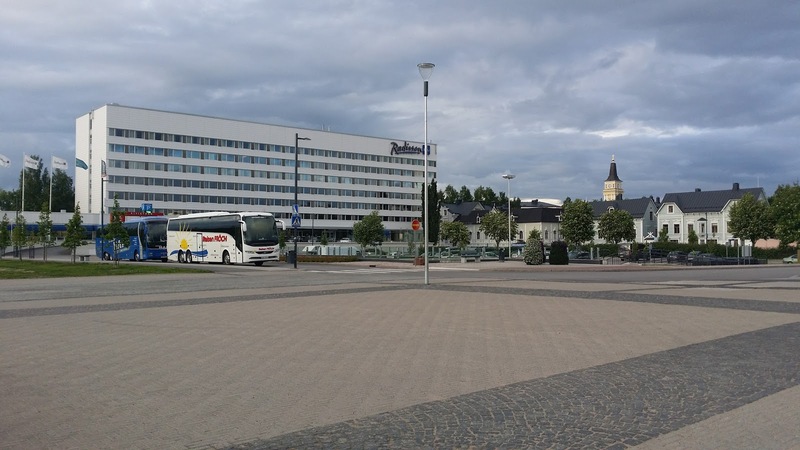 A bus ticket from Nuorgam to Rovaniemi alone would cost 95.50€. 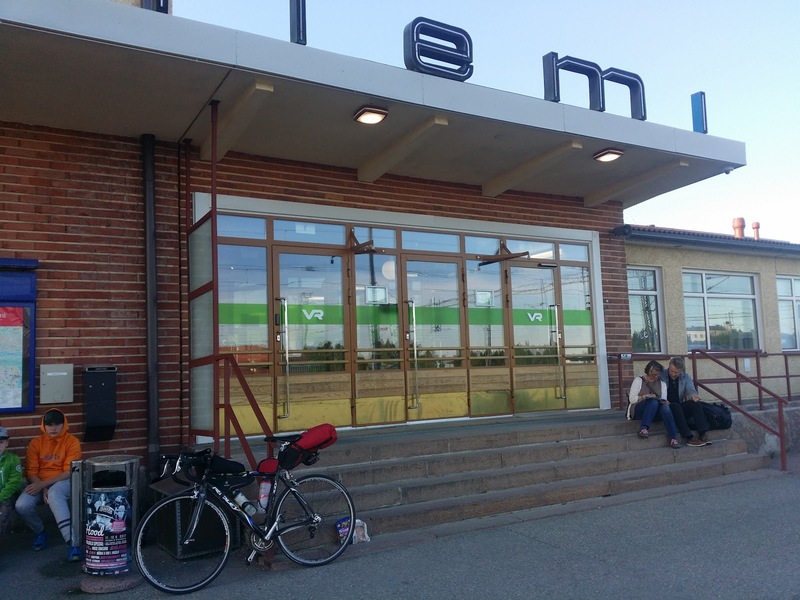 I got lucky by finding a cost-saving night train ticket for the rest of the way as it cost just 43,10€. I would be able to get affordable nutrition and hydration from local shops, ABC fuel stations etc. Towards the end of my summer vacation I rode a couple of longer rides. 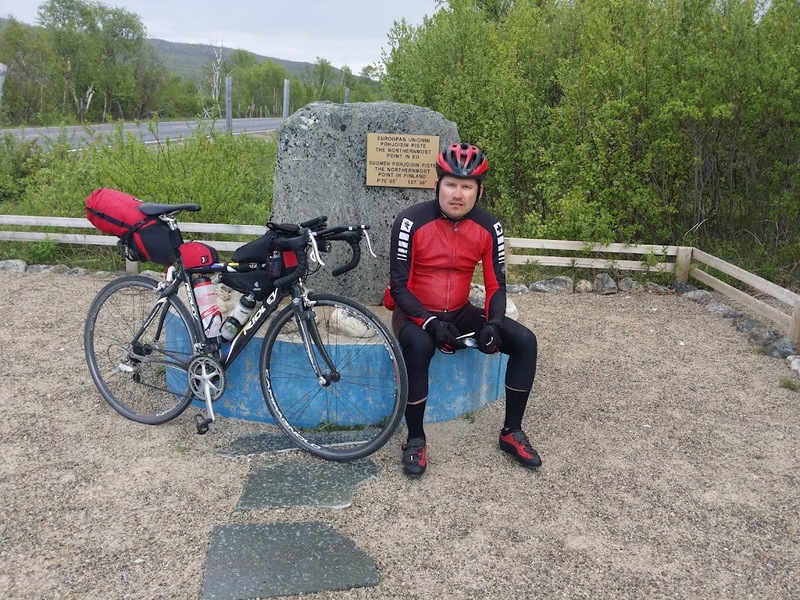 I was starting to feel hesitant about the project as these rides were not entirely confidence-inspiring and the weather forecasts didn't look too great, either. But dreams don't come true by surfing the web. 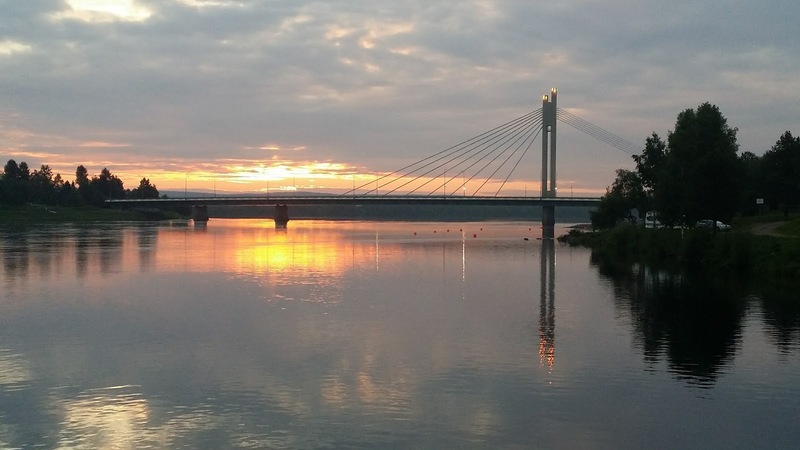 Trans Finlandia would make for great training and test my metal in terms of the ITI challenge ahead. 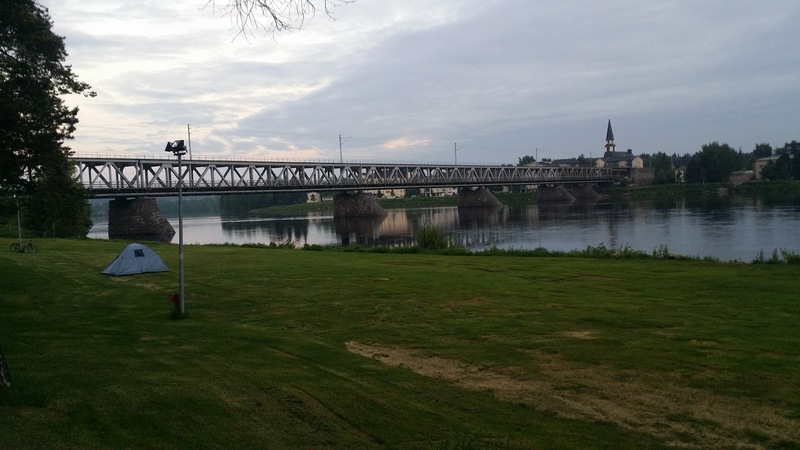 About half of the way through the ride I would also be able to visit a place where I spent some time in my childhood, during both summer and winter time. Martinniemi in Haukiputaa was where my grandparents used to live and I wanted to visit their old place for the first time in years. The opportunity to do something like this are really rare. 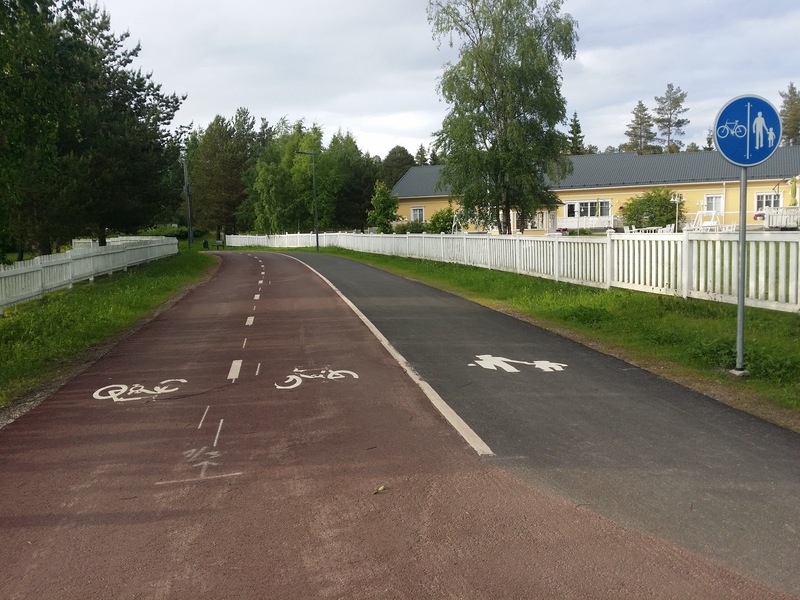 I would be riding in memoriam of Mike, and in addition Finland is celebrating 100 years of indepenence. With this background I thought ”now or never”, ”come hell or high water”. My physical performance was not on the level I wanted but I would be riding with the theme ”weak body, strong mind”. I knew my head would not fail me, but could my body take it? I chose to ride on my old road bike, a Ridley Excalibur from 2006, with a 1998 Campagnolo Record group apart from the cranks, Capagnolo's Khamsin wheels from 2006 and a Profile Design T2+ Aluminium extra handle bar. I swapped the original 53 tooth chainring to a 50 tooth Stronglight. As I was planning on making some sort of a ”record” on this trip, I chose lightweight, minimalistic gear. A Porcelain Rocket seat bag and Revelate Designs Gas Tank as well as a Jerrycan and one Mountain Feedbag would be strapped to the bike. 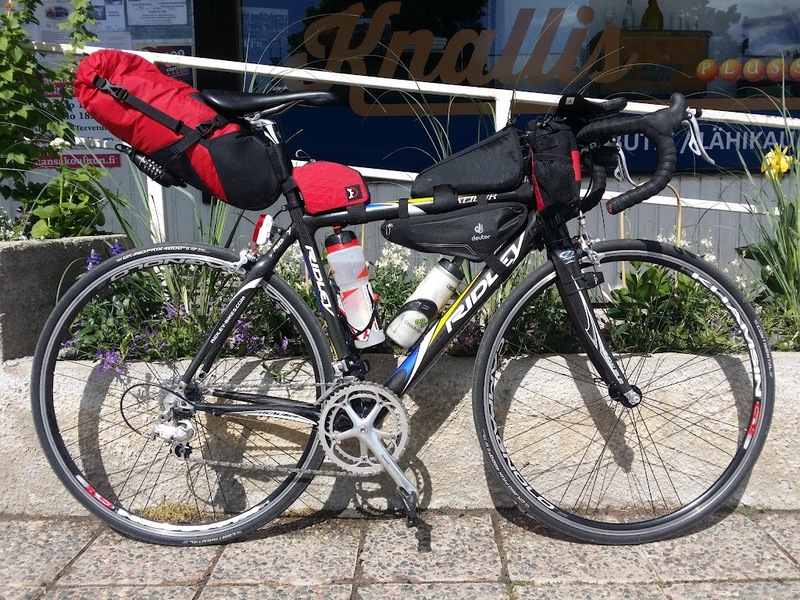 A small framebag made by Deuter and 0.7 and 0.95 liter (Elite Maxicorsa) bottles and a pump would fill the frame triangle. 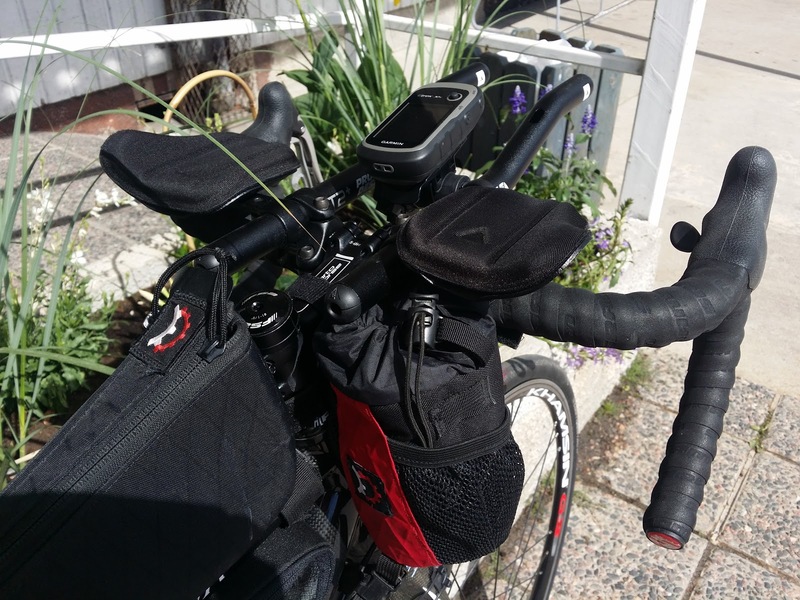 I would be using a Lumicycle Explorer light with the smaller battery, and a Planet Bike Superflash at the rear. I chose to ride with 25 mm Continental GP4000S II tires. 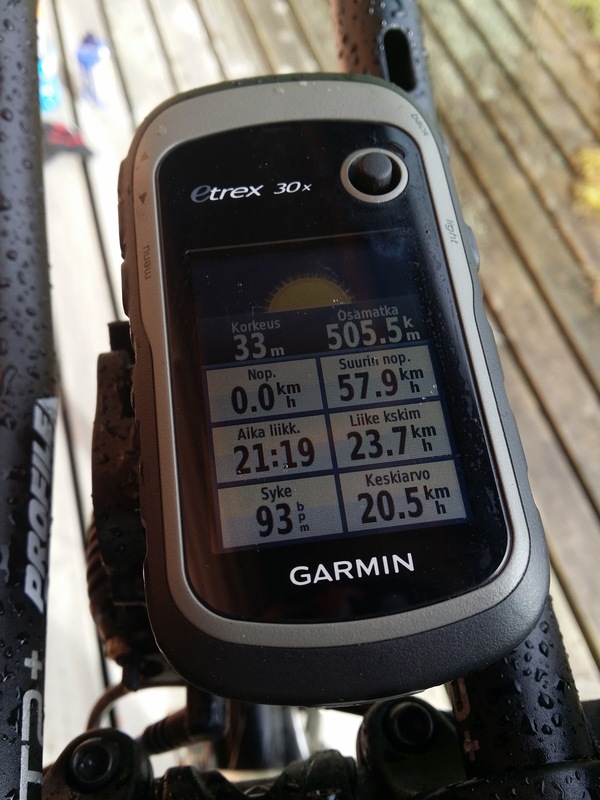 I used a Garmin eTrex 30x for navigation and recording the route. I would be riding with a Merino wool Kona Base Layer shirt with a windproof long sleeve Assos jersey, Assos bibs, Nalini knee warmers, Woolsense socks and Endura MTR Glove II cycling gloves. My shoe of choice is the fi'zi:k R5. I used www.ridewithgps.com and www.kurakartta.net for routing. The latter enabled me to avoid gravel and mud roads. 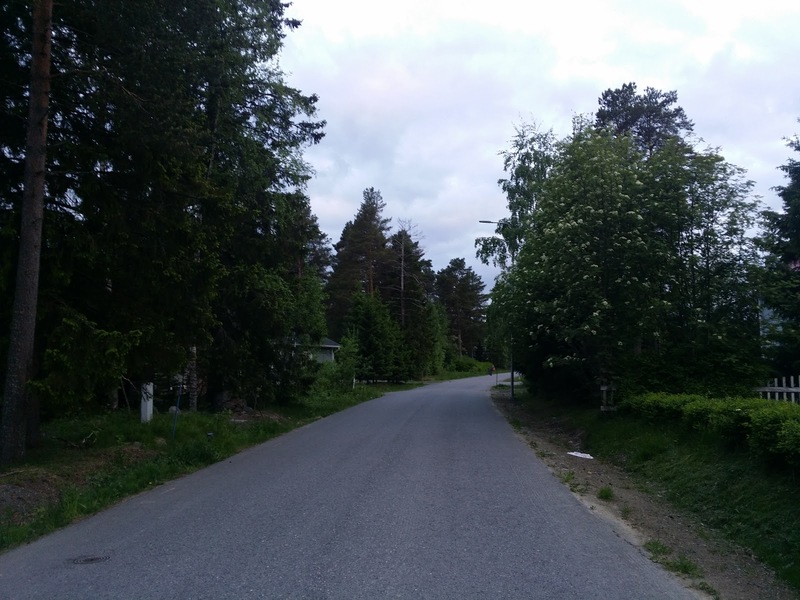 I had originally planned on leaving Hanko on Monday June 26th, at about noon, but ended up starting Sunday June 25th in the afternoon, to get a safety margin to the bus ride from Nuorgam as long rides always give you some surprises that tend to slow you down. Leaving on Sunday would give me a bit of wiggle room for the bus leaving at 4:40 AM on Saturday July 1st. 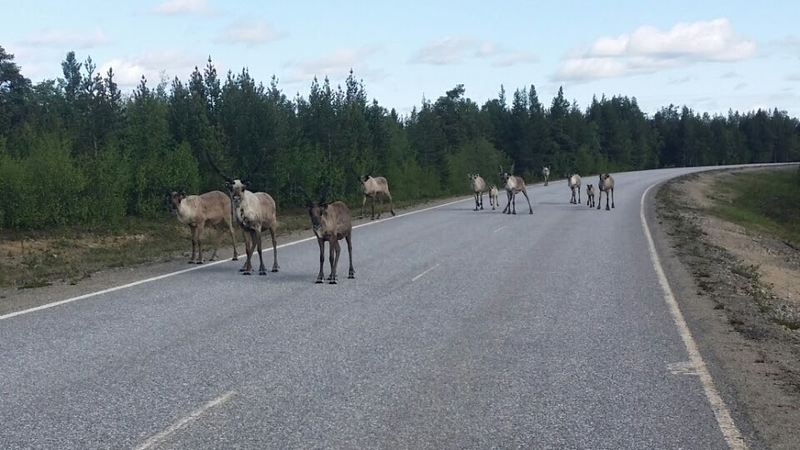 I was expecting to meet some Mid-summer day traffic but thought it would probably get a bit easier towards the evening. 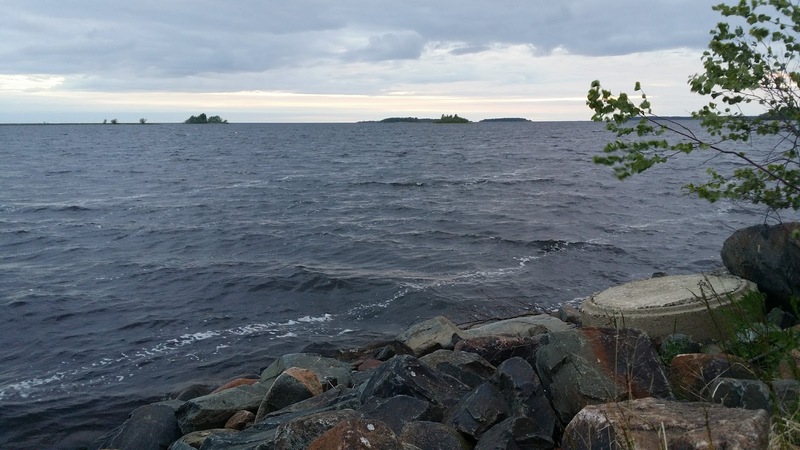 I got a dream start from Hanko, as I had a great tail wind all the way to Tammisaari. I was averaging around 35 km/h. The road was nice, as the road shoulder was wide and there wasn't that much traffic. From Tammisaari to Salo the wind was blowing quite hard from the side with plenty of gusts. On this road the road shoulder was much narrower and there was plenty of traffic. Riding here was a bit challenging at times. 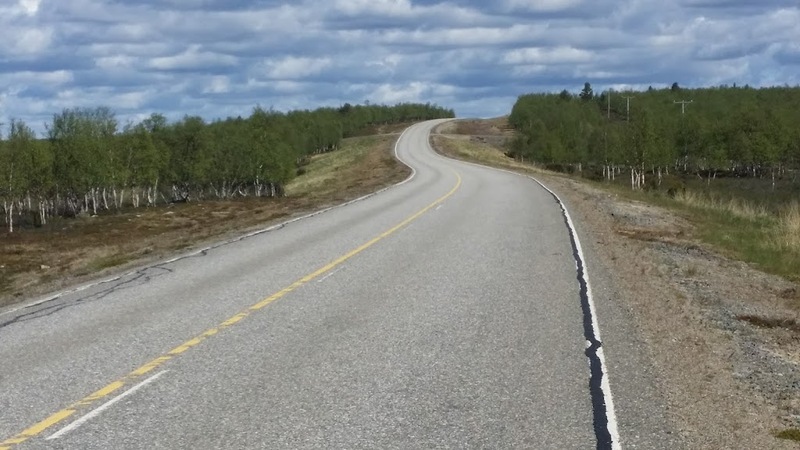 In addition the road has some considerable hills. My next break took place in Forssa and I replenished my snacks from the local ABC station. 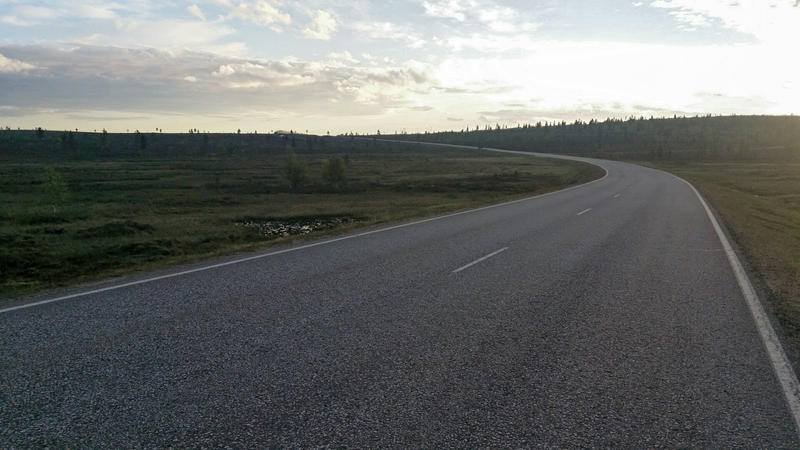 There was surprisingly much traffic between Forssa and Humppila but I didn't really have trouble riding. Closing in on Tampere the road surface was very wet. Evidently there had been some heavy rain here but luckily it had already passed. The evening was beautiful. 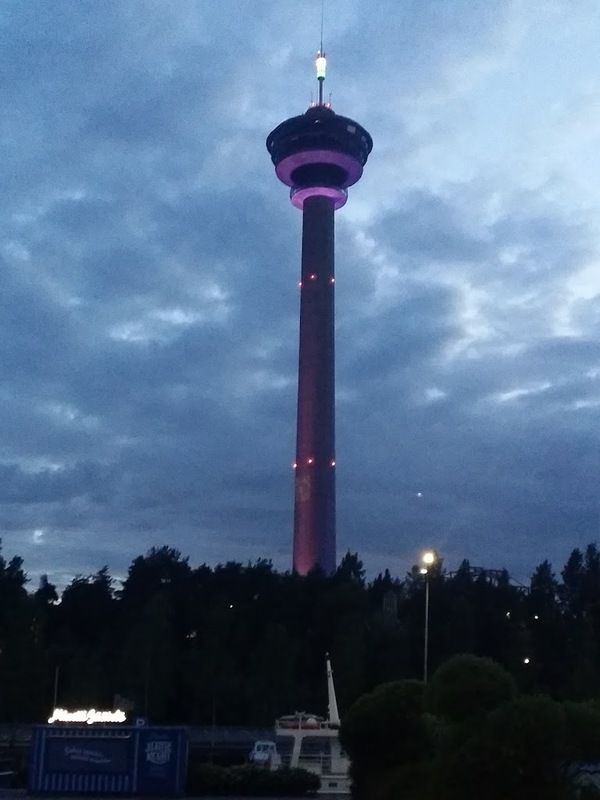 Reaching Tampere I started to feel hungry and I though about getting something to eat at a 24h ABC. 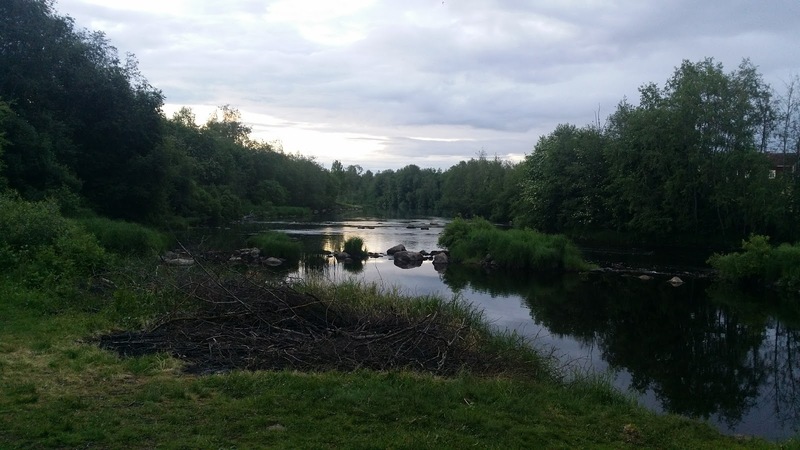 Tampere is a pretty curly place to navigate through, but with the help of Google Maps and a bit of effort I found the Lahdesjärvi ABC which was closest to my route. 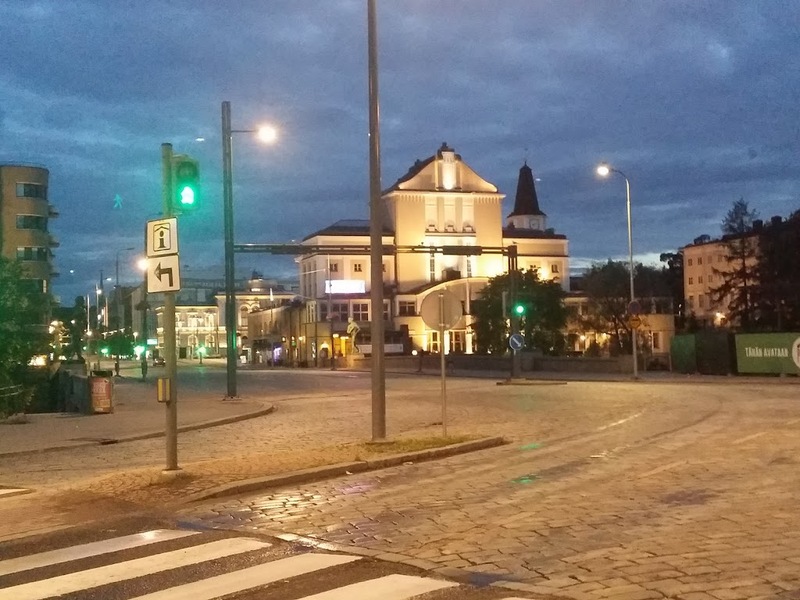 I had been making great progress, as the average speed upon reaching Tampere was close to 30 km/h. 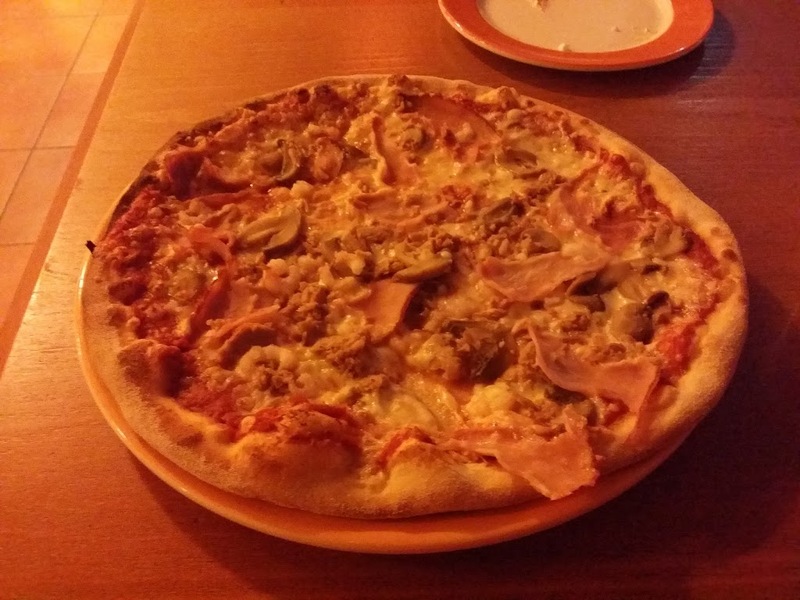 After a pizza I carried on through down town Tampere at 2 AM. 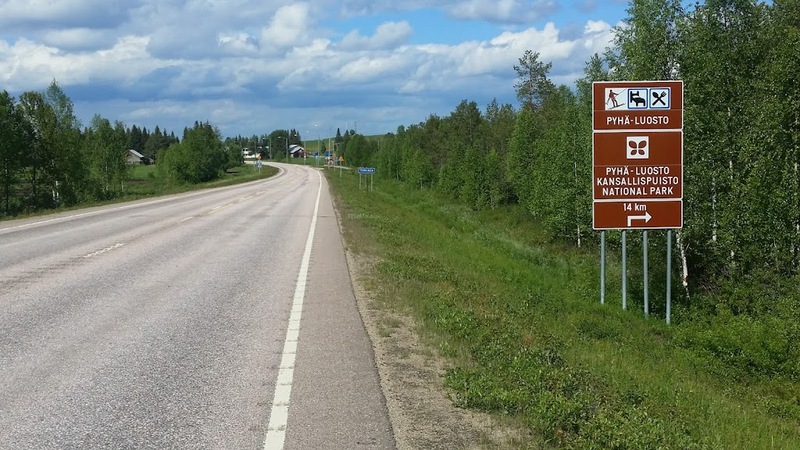 Having passed the center of the city I headed towards Ylojärvi and road 65 with the intent of finding somewhere to sleep. 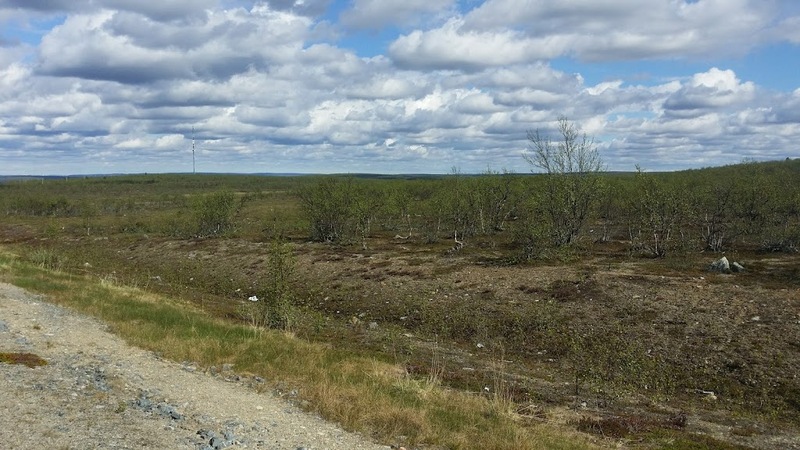 This is where I met the first little surprise, as the road had long stretches of moose fence making it impossible to deviate from the road. 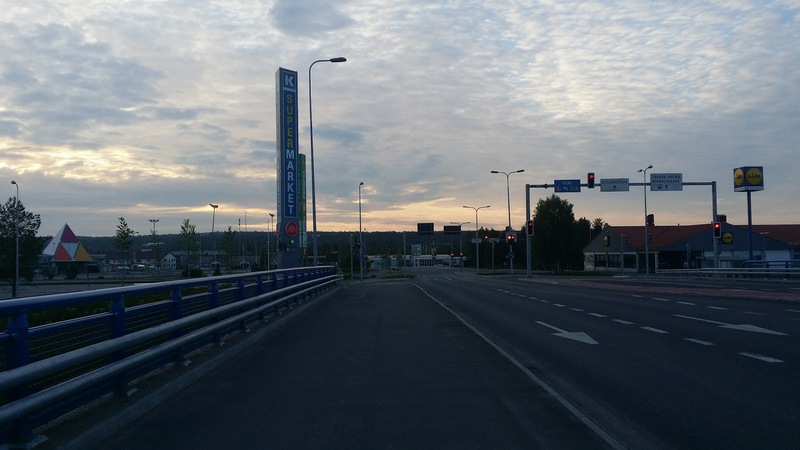 I was getting a bit tired, but finally I reached the crossroads of the Sorvajärventie road. 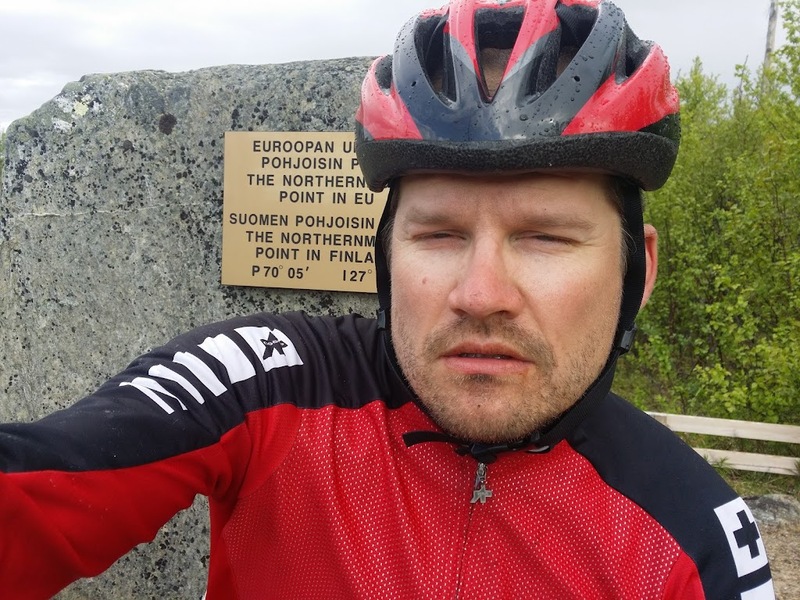 I had ridden 282 kilometers so far. The terrain was wet as the rain front had relieved its load with fury. I found a nice spot in the forest to sleep in. By this time it was a bit past 3 AM. I slept intermittently and it didn't take long for the morning traffic on road 65 to start. At one point during the night there was a slight bit of rain. 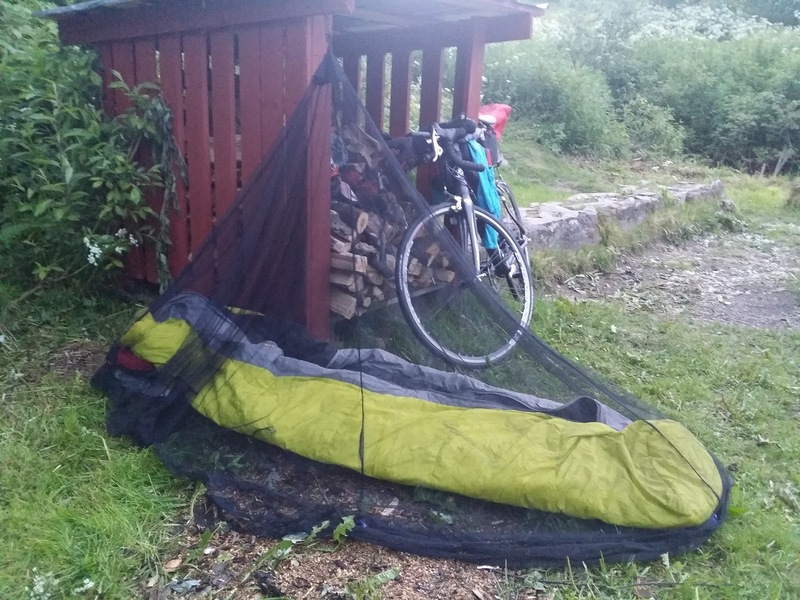 After a bad ”night” I got up and packed my bike at around 7.30 AM. My next task was to find coffee, as my machine just won't start properly before a proper cup of coffee. Just 10 kilometers in the day I found Keidas 65 (Oasis 65) that had luckily opened its doors just a bit before the official time of 9 AM. After a cup of coffee and something to eat I kept riding on, but the going was somewhat painful. A big day followed by bad sleeping was easy enough to feel in my legs and I wasn't that alert either. While I was going through a bit of a struggle, motorists were starting to show signs of aggression in their driving style. 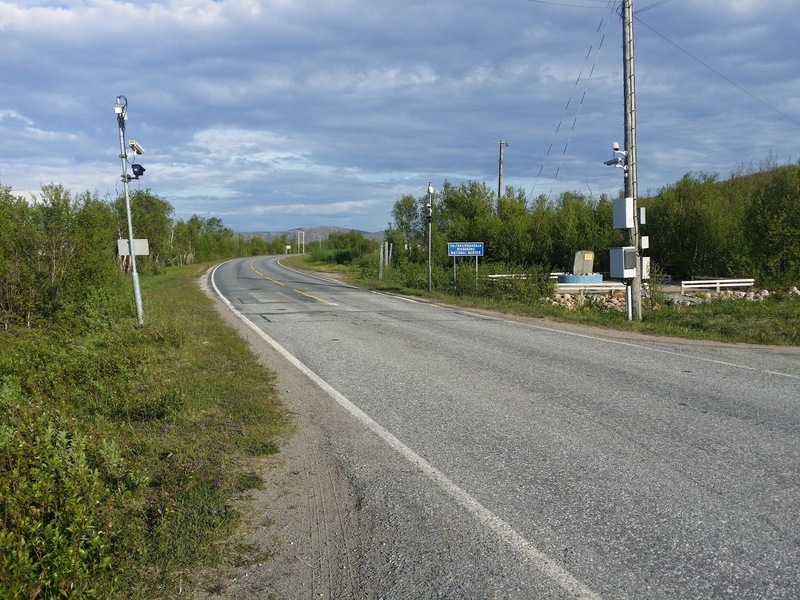 Cars kept passing me very close, and aggressive passing was commonplace even among the cars coming my way. I had to stay as sharp as I could, as the road shoulder was minimalistic. 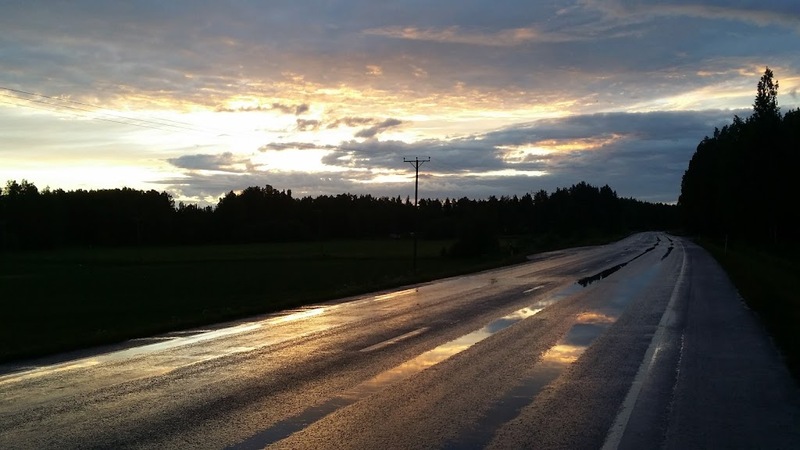 Weather forecasts had showed some heavy rain in Pohjanmaa for monday. As the day went on, these forecasts were beginning to show true. The heaviest rain hit me near Virrat, and by the time I had passed Herraskylä on road 66, it was just pouring down. Motorists were acting like they had no brains. Speeding and crazy passing manouvres were common and ample truck traffic added its own risks. With such intense rain visibility was poor and I took shelter by the side of a barn next to the road. 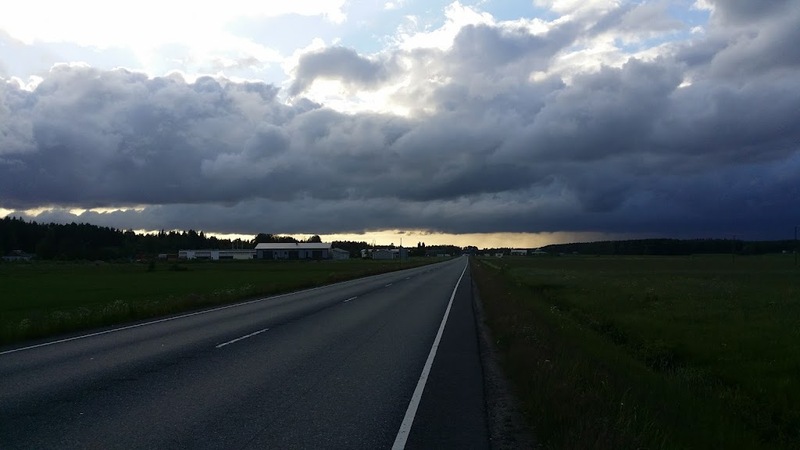 As the rain passed, I kept riding on, still paying close attention to driving very cleanly on the virtually non-existent road shoulder. 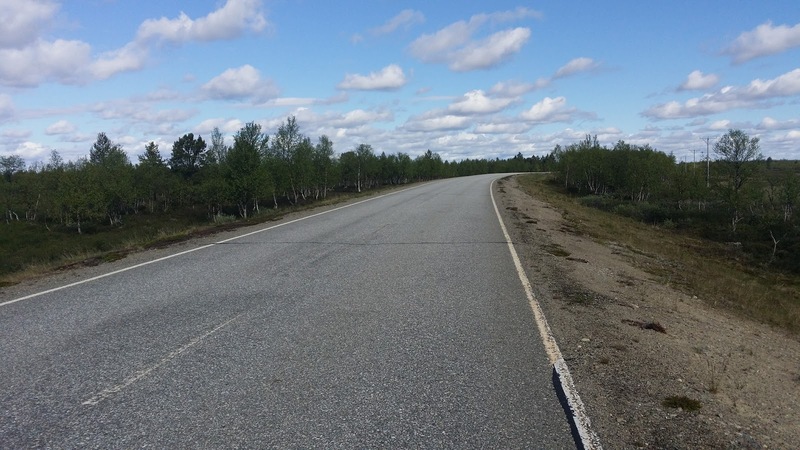 The white lines at the road's edge were serrated so I wasn't able to ride on them. Despite my careful riding most motorists didn't seem to care about my safety. 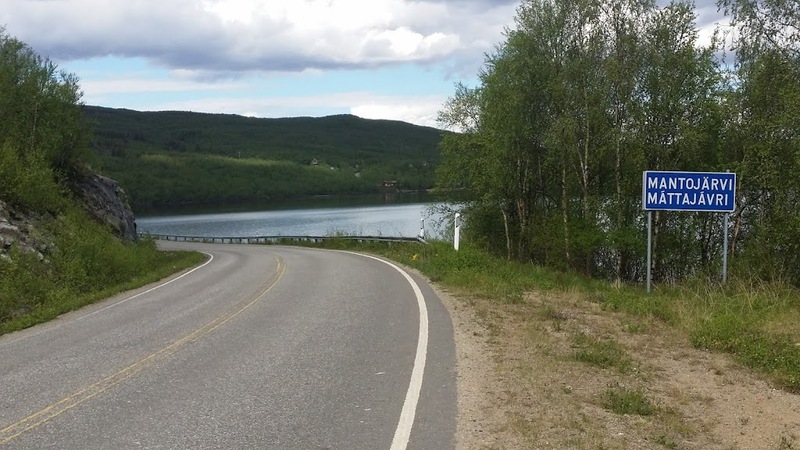 Other than the traffic, this was a nice route with undulating hills and nice scenery. The local ABC station had a Hesburger restaurant so I had a burger, a doughnut and some coffee. The rain started again, this time with thunder and lightning, so this break couldn't have been timed more perfectly. 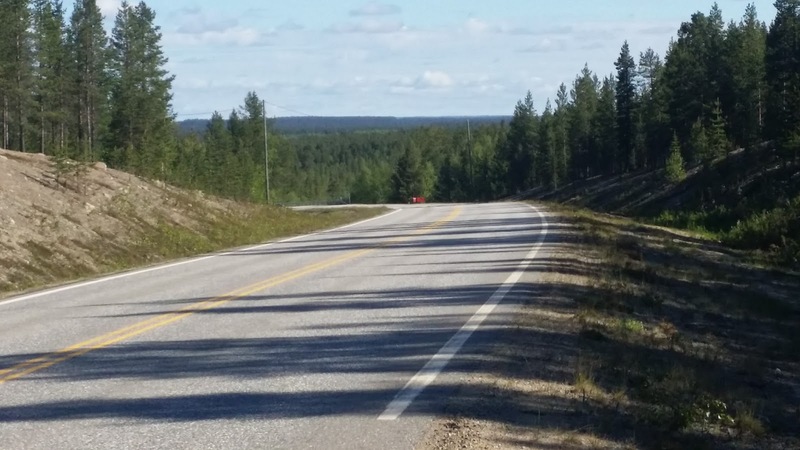 After Alavus I had to stay on road 66 for a short stretch more, but things changed for the better as I was able to turn to road 711, heading towards Vimpeli. The road was smaller with much lighter traffic. 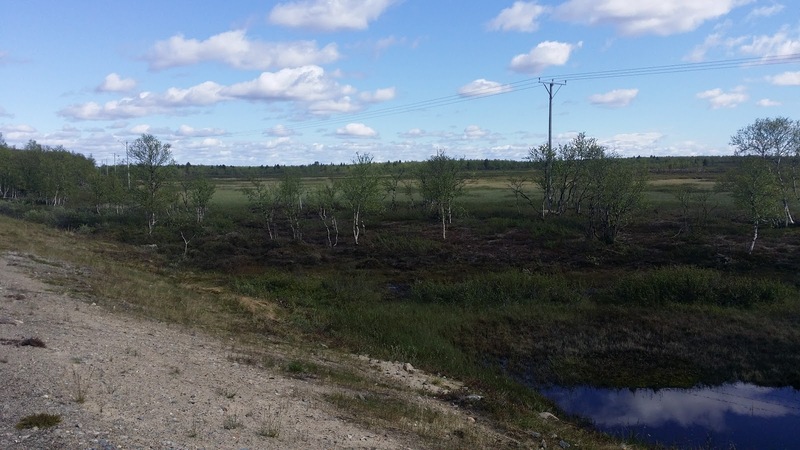 The road went through impressive forest and marsh areas. A small snack break in Vimpeli was followed by a visit to the local grocery store. I spent a bit of time on my phone, figuring out potential places to spend the night. I was planning on riding until midnight. 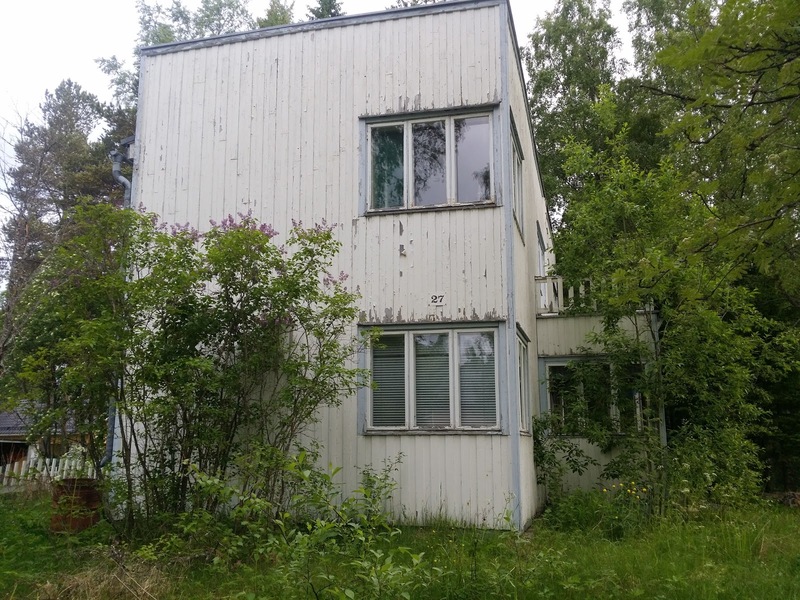 I carried on towards Kaustinen. A beautiful sunset was followed by more rain. Thankfully this was just a short shower but it was still enough to get my clothes somewhat wet. As the rain gathered momentum, I donned my Endura MTR jacket which was proving to be a fantastic piece of gear. My legs and feet were, however, sprayed with water. 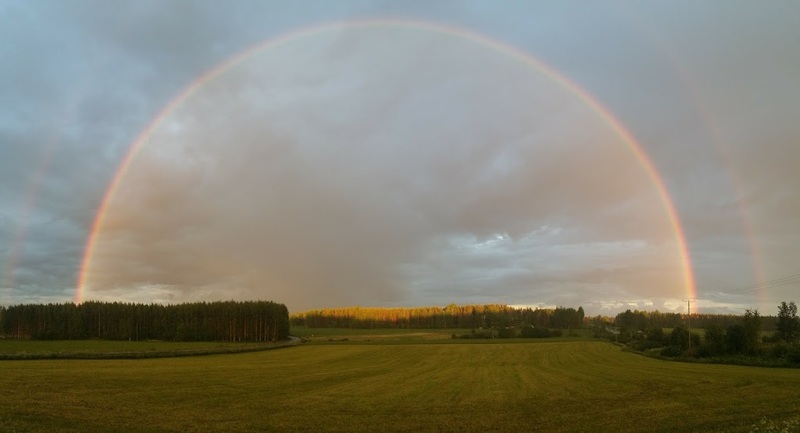 The sunset and rain made a magnificent rainbow! Today's ride: 241 km. 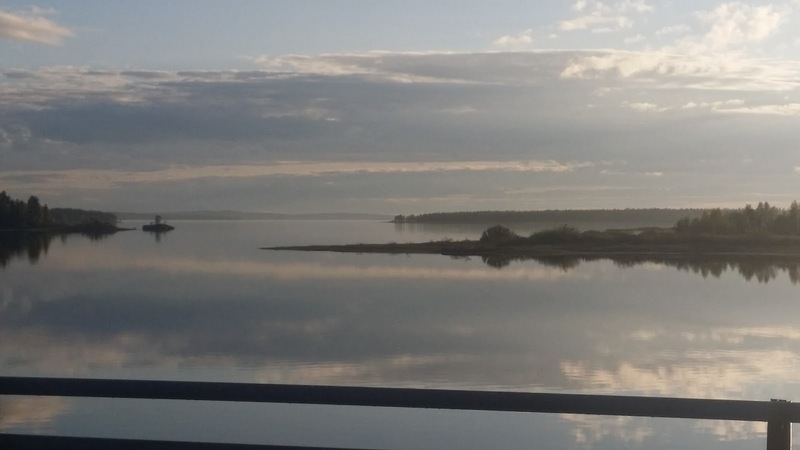 Total distance from Hanko: 523 km. It was about 40 minutes past midnight as I updated the situation on social media and went to bed. I slept well and didn't get up until just before 8 AM. I was happy, after such a difficult start. I enjoyed my morning coffee at an R-kioski. But soon I felt a bit of regret for the late start as it started to rain again. Weather radar images were not promising, meaning I would spend some time riding through the rain. I didn't really have time for taking rain breaks. The rain seen on weather radar reached me. I rode the first 40 km of the day in rain, but I was feeling quite fine. The roads were wet for much longer, but by the time I was getting close to Ylivieska they dried up. 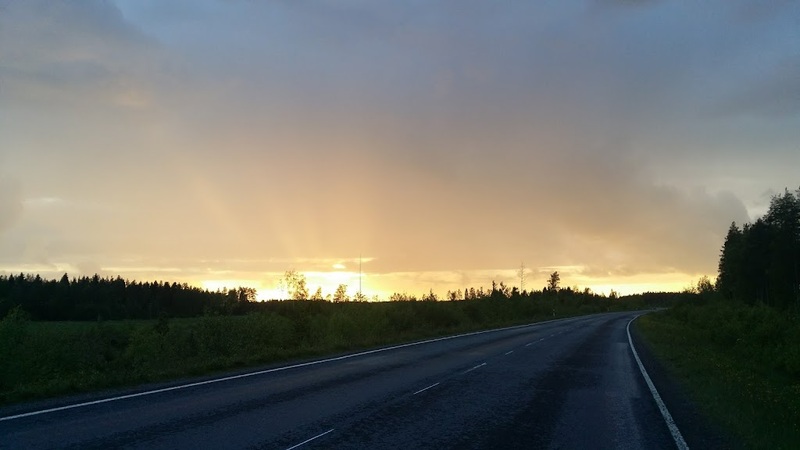 A touch of luck: just as I got in the Ylivieska ABC station, the skies opened again. A bit of snacks and a bit of shopping. During these short snack breaks I usually bought a banana, sport bars, a Coke (that I drank right away) and a Gatorade bottle that I placed in my jersey's rear pocket. From this on, I started to drink blueberry and rosehip soup from the bottle on the bike. The rain stopped and at some point the roads dried up again. I faced the next surprise. From Kaustinen onwards, my left Achilles tendon had become sore and it had kept on getting worse. 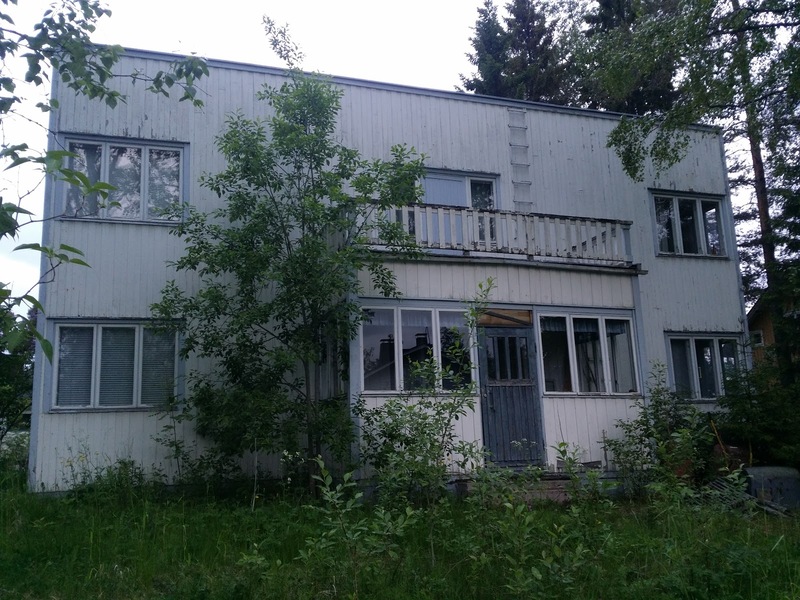 After Oulainen the pain was so serious that mental tricks were not enough to ignore it. Since I was not even half way through the trip, I decided that on the next break in Vihanti I would pay a visit to a pharmacy in addition to getting my routine snacks. Vihanti's pharmacy proved to be a good one. I told the staff what I was doing and that I doubted that the tendon might be getting inflamed. The pharmacist naturally suggested rest but that was equally naturally out of the question. We decided to try if Voltaren Forte pain gel would help. 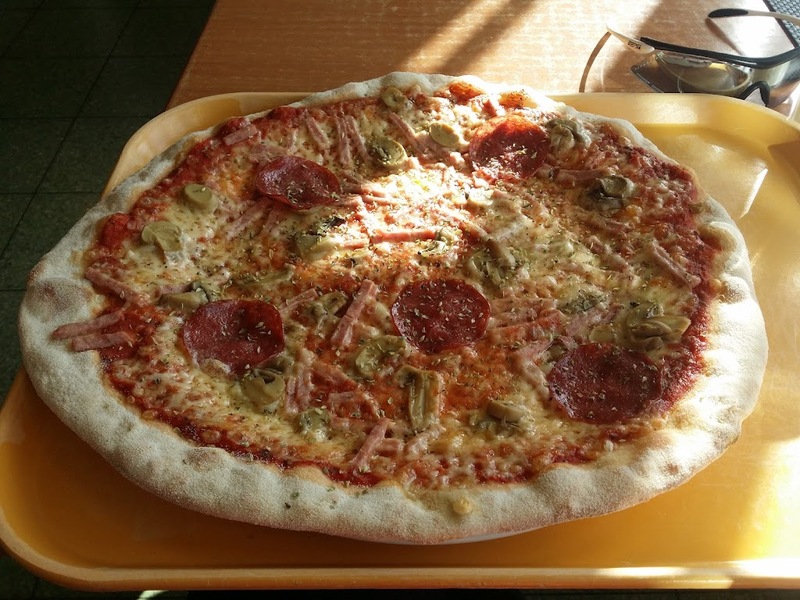 After eating I paid a visit to the larger ABC in Liminka, thereafter heading towards Oulu. 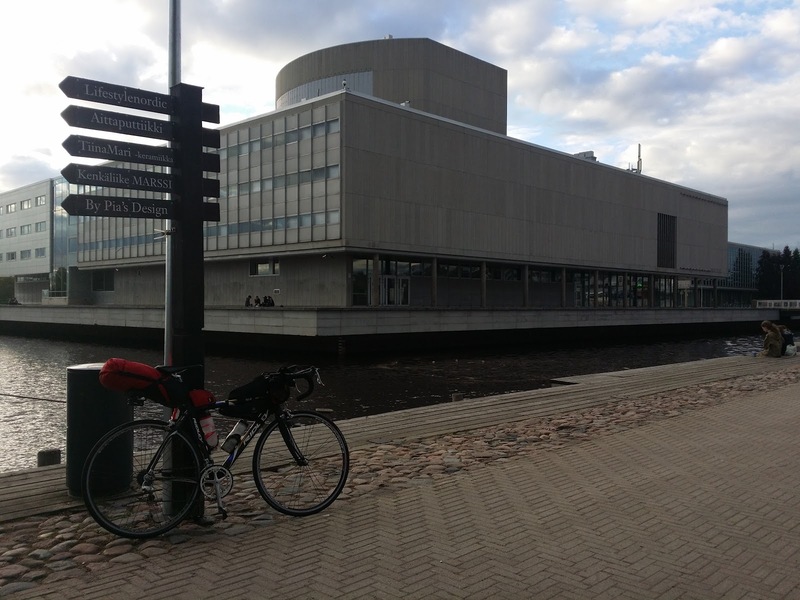 Riding through Oulu was enjoyable, as the route went along the river, passing town hall and the library. 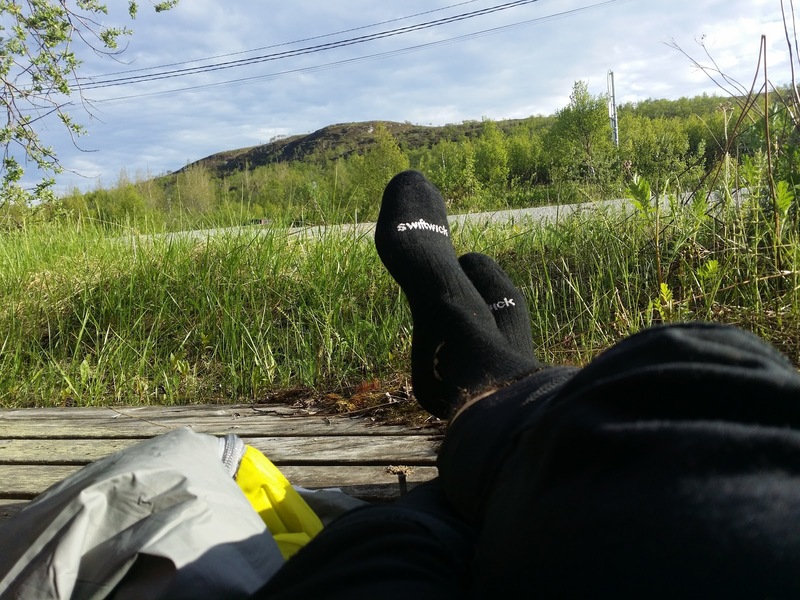 My Achilles tendon was not feeling much better but I only had 25 km left to Martinniemi. 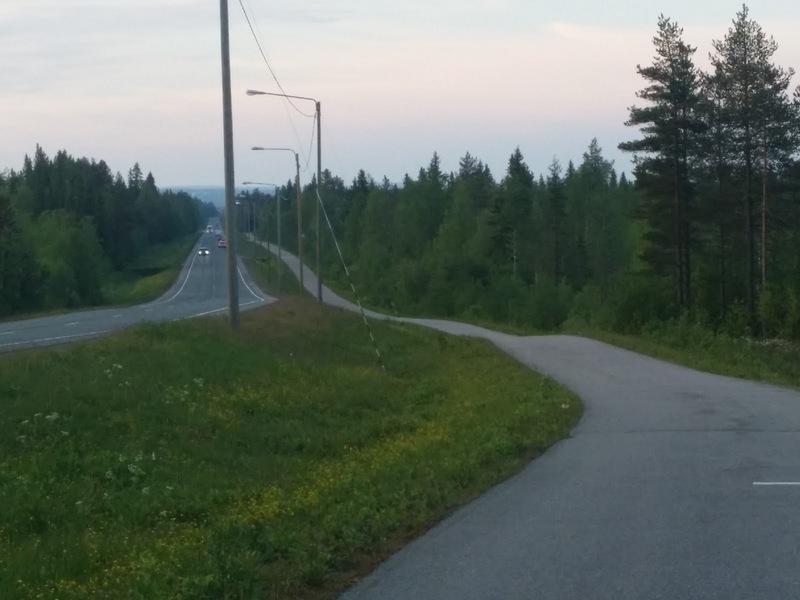 I purposefully took the same road to Martinniemi my parents had always taken when we came here all those years ago. During the last 30 or 35 years, however, the scenery had changed quite a bit. But finally I was on that old familiar yard! It was 11 PM. 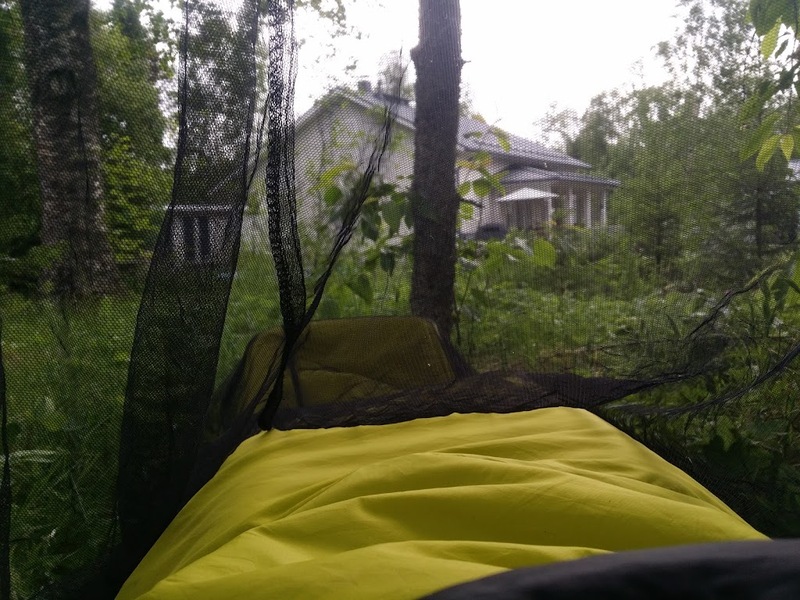 It was clear I would sleep on the yard, as no-one lives in the house anymore. 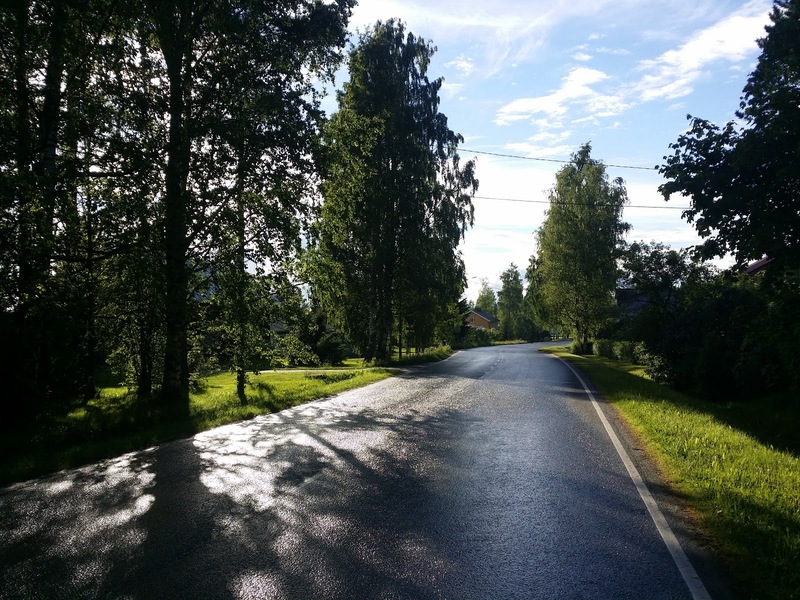 Before setting up my overnight gear I rode a small tour through Martinniemi to Villenniemi. Villenniemi was about 3 kilometers away. 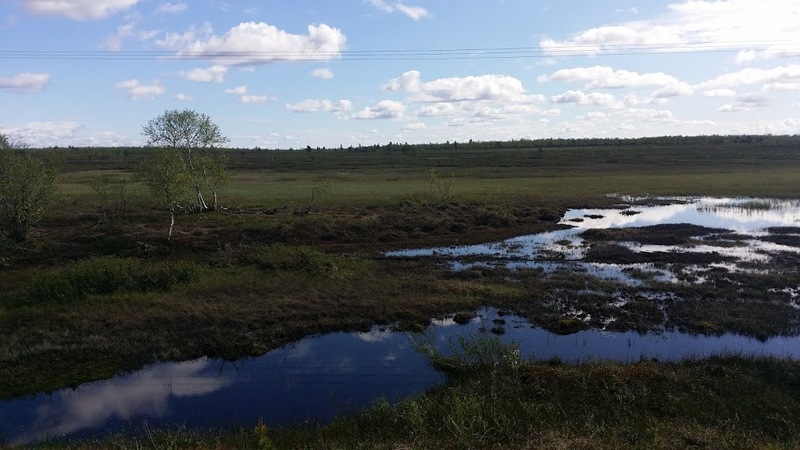 There the scenery had, quite naturally, changed dramatically as well. 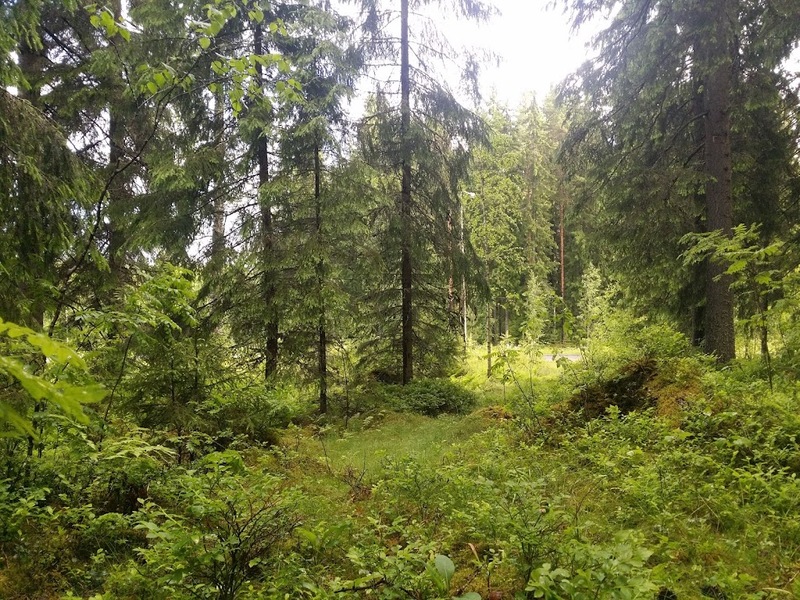 Martinniemi has an interesting history as a sawmill operated by Rauma-Repola was active to the end of the 1980's and the sawmill had a long history of its own. The mill even had its own railroad track leading to it, but now parts of this track have been taken away to make room for housing. The Villenniemi harbour has been completely transformed from the 1980's. The sea views and islands, however, were naturally just like they had been. NOSTALGY! 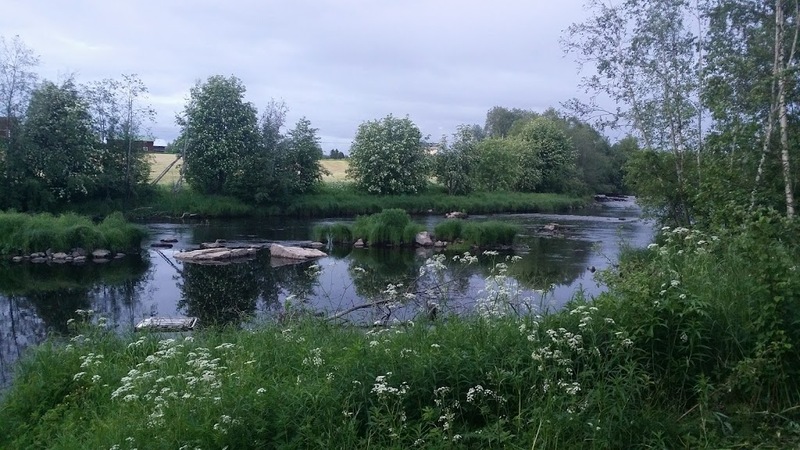 I had come here often with my grandfather to go fishing. I was feeling emotional. 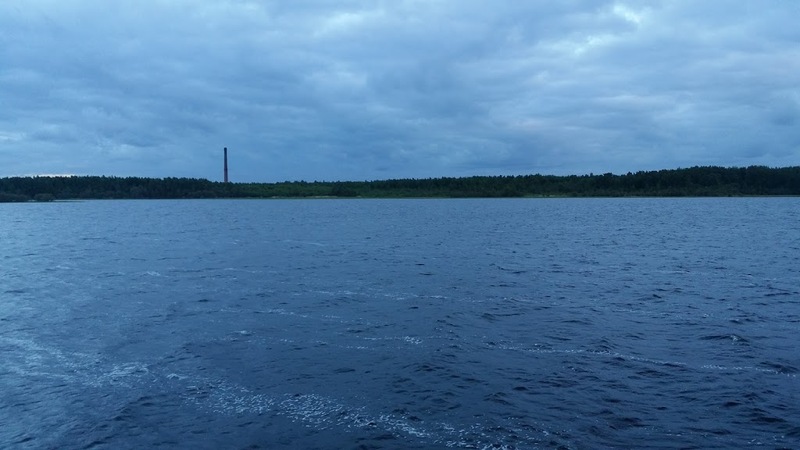 The sawmills powerplant chimney is still there. I rode back to ”the magic garden” and stayed for the night. 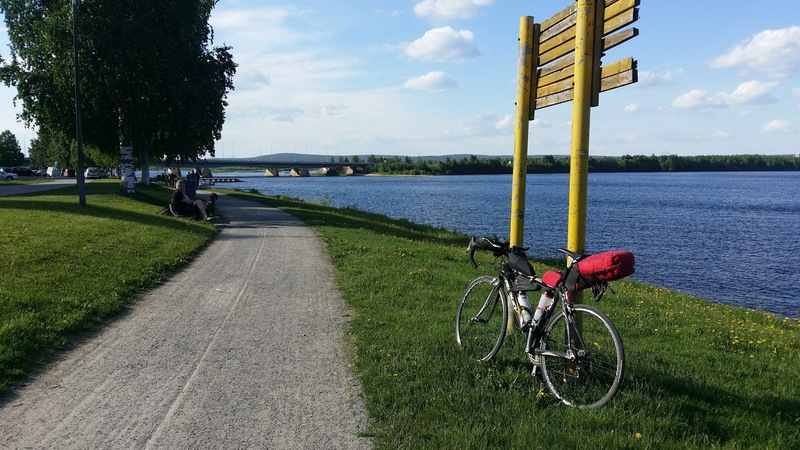 Todays distance: 251 km. 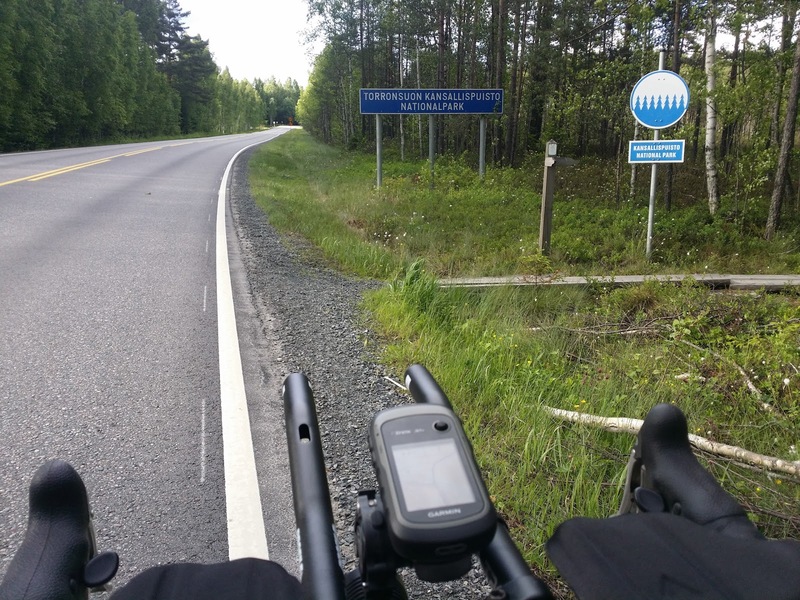 Total distance from Hanko: 774 km, meaning I was a bit more than half way through. One thing had not changed over the decades: mosquitos were abundant, although the cool and windy weather made it a bit easier. I went to sleep a bit after midnight. I slept reasonably well. I got up at around six. As I was packing up, the neighbour, easily recognizable but 30 years older, came to check what's going on. It didn't take long for him to remember me. We chatted about the past for a while. I rode back to the Haukiputaa road number 847 which luckily had an ABC station that opens its doors at 6 AM. Coffee? Check. Energy? Check. I wasn't able to find by phone charger and the one at the station didn't work either. Luckily I had a bit of juice left both in the phone and in the power bank. I checked the weather forecast. The wind would be straight in my face and... yup, more rain on the way. 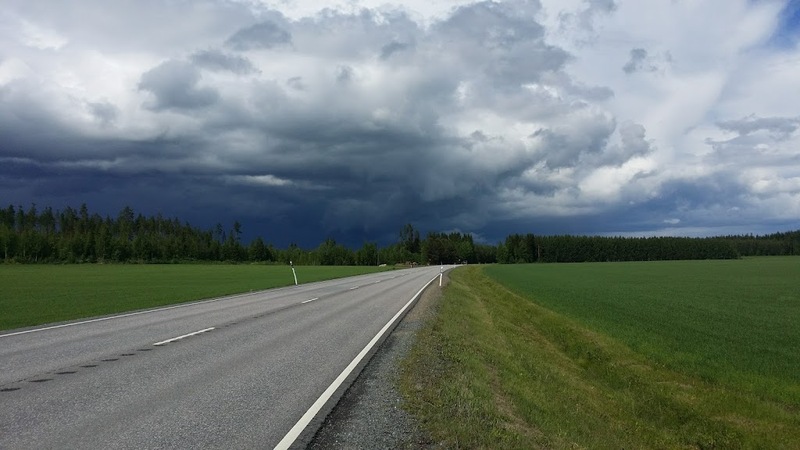 The rain area reached from the South-East all the way to the town of Ii and it looked like I might have to ride in rain all the way to Kemi. I stretched my breakfast a little longer in the hopes the rain would move further during that time. At the petrol station the weather was dry so before long, a bit after 9 AM, I carried on my journey. Riding was laborous, pushing against the head wind and my Achilles tendon was pretty sore again. The pain gel hadn't done the trick. Reaching Ii, it started to rain. 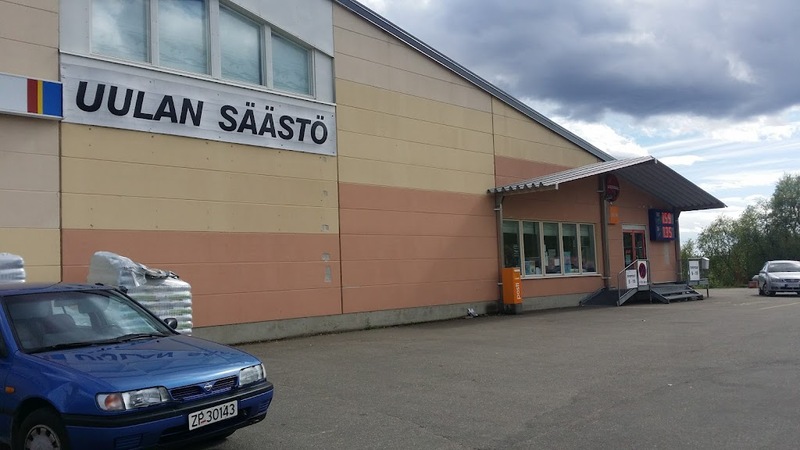 I paid a visit to a massive general store called Kärkkäinen to buy a phone charger only to find later on that I had placed my original charger in my jersey's pocket by mistake. After Ii the rain got heavier and temperatures dropped. Riding started to feel like a battle for survival. The situation didn't look good at all. As I reached Merihelmi I decided to have a break, eating sandwiches and drinking hot chocolate in the warmth of the restaurant. Once more, I checked the eather data and ate a grilled sausage as the staff started barbequing. The cafeteria had a great view out to the sea. At some point the rain started to ease off and I got back on the bike. I was feeling somewhat better than before the break, but my Achilles tendon was more sore than ever. Kuivaniemi (or Dry Cape, which it really wasn't) was near by so I paid another visit to a pharmacy. I bought a small pack of Ibuprofen and took a double dose right off the bat. I also reapplied a generous amount of pain gel, as the rain might have reduced its potential. The ibuprofen started to have a bit of an effect, cutting the worst edge off the pain but riding was not efficient and I wasn't able to ride off the seat properly. 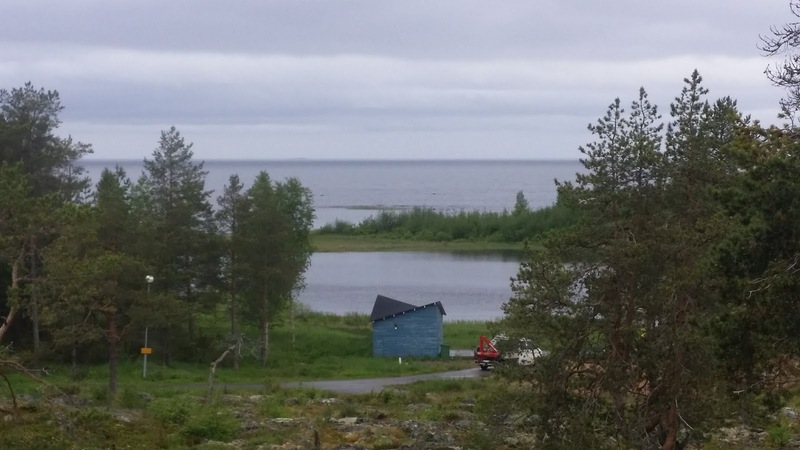 My next break took place in Kemi where I went to the local supermarket. I ate, drank and refilled my snacks. 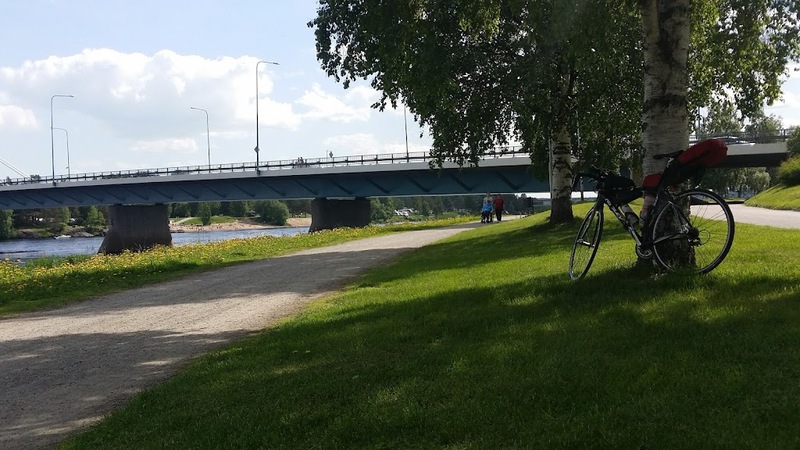 The weather became much better and I aimed my bike towards Rovaniemi, a city that's familiar for me from the past, with lots of nice memories. 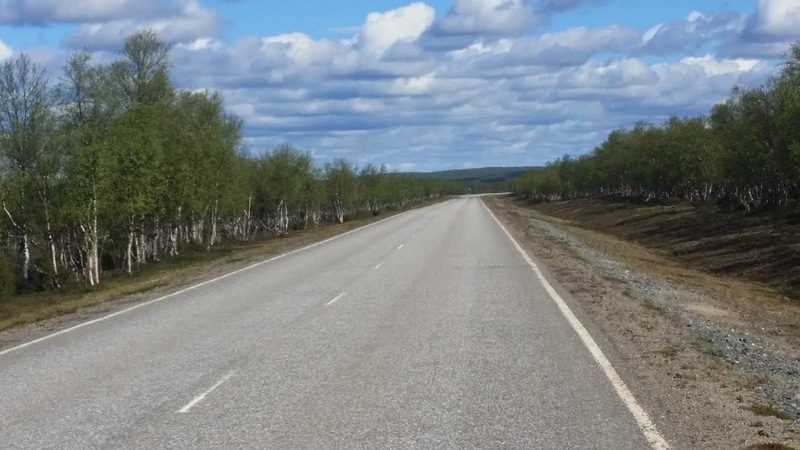 The road from Kemi to Rovaniemi was also familiar as I had driven through here in a car two years earlier. 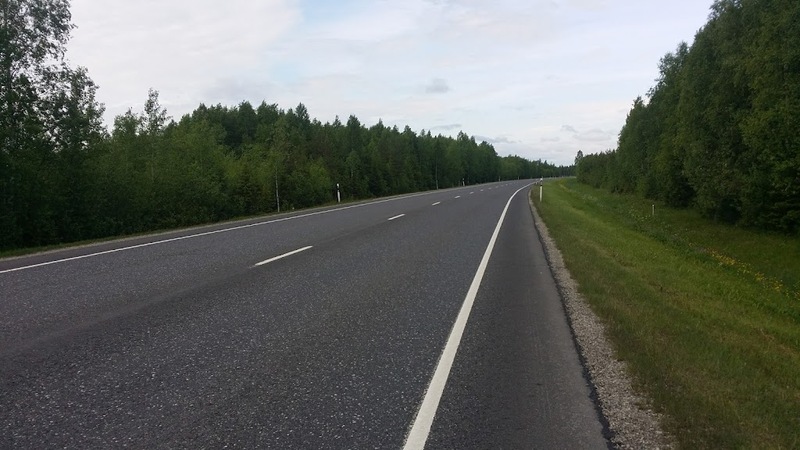 The E75 is a wide road in good condition, complete with a wide shoulder, and the motorists were acting much better than the ones on road 66. 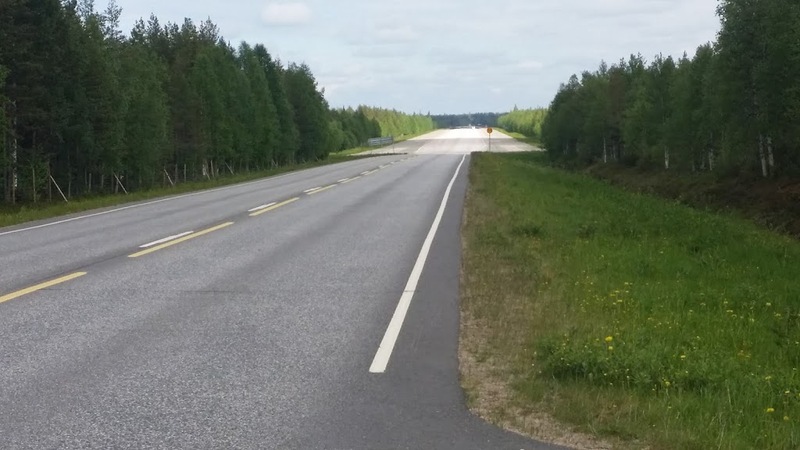 About 40 km before Roveniemi a truck driver impressed me for the first time on this trip: I heard it coming but it was clearly slowing down. A couple of cars were coming the other way, and the trucker slowed down even more. After the coast was clear, the trucker passed me in a very smooth fashion, with plenty of safety distance. I, of course, waved a thank you to the driver for such great action. With paracetamol and pain gel my Achilles tendon had been relieved of some of the pain, but this stretch of riding was brutal and raw. 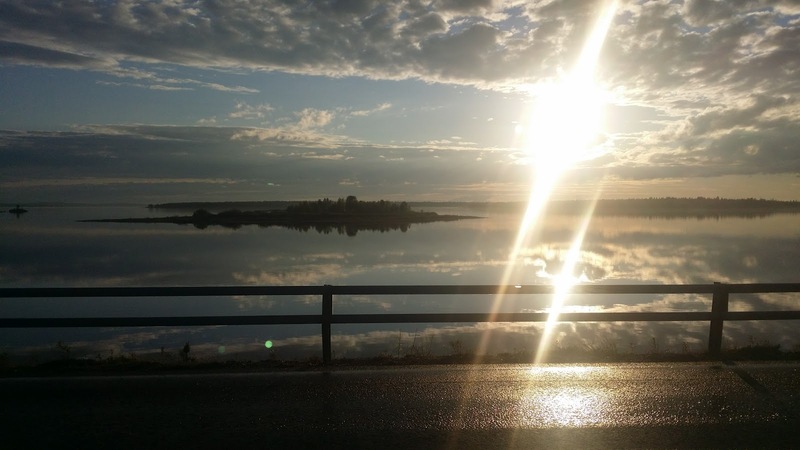 It was clear that I would ride to Rovaniemi and then make an assesment of the situation. 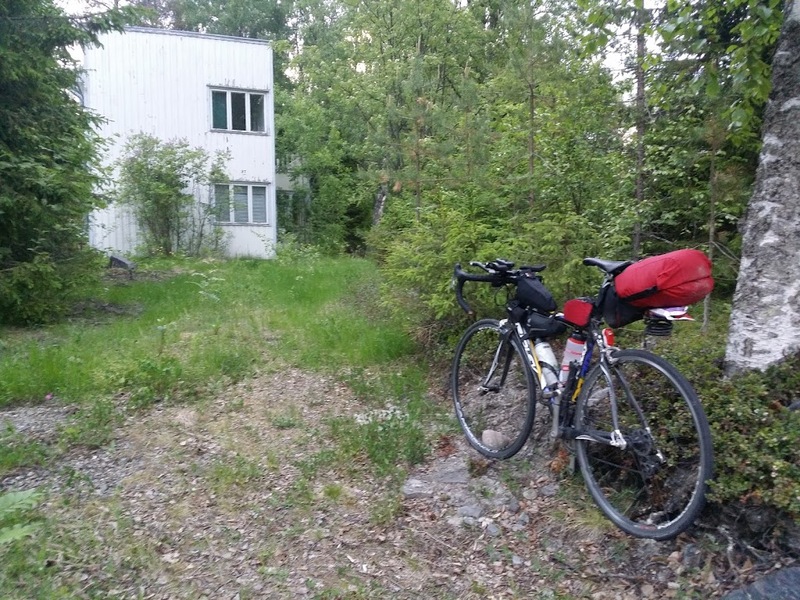 The mental tricks I was using worked quite well: if I was 40 km from Rovaniemi, that would mean I'm really close, as 40 km is the distance of my daily bike commutes. I concentrated on the things that were ok, on the lighter side of things, despite the riding being so brutal. The bike was working great, the weather was nice... I also reminded myself that I've been in much tighter situations. I thought that having a tough time on a bike is just light cruising, when compared to the things people go through in ultra-distance running races. I was on my summer vacation, living my dream, far away from everyday routine. I wanted to be in this very moment, perhaps suffering a bit, but it was all rewarding and the greatest prize would await in Nuorgam. 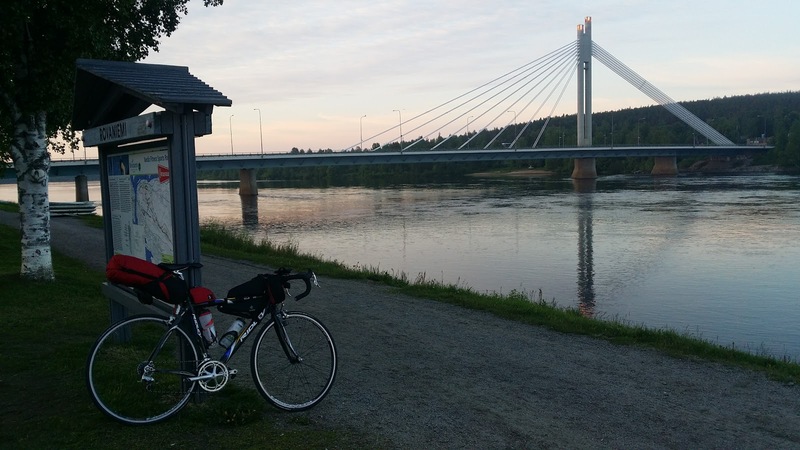 Upon reaching Rovaniemi I was physically a bit shattered, but the rest of the way would be easy cruising. I intended to find another ABC station, but the one at Rovaniemi was just a cold petrol station so I headed down town. It was nearly 11:30 PM. I was hungry in a big way so I ate the largest burger meal Scan Burger had to offer. 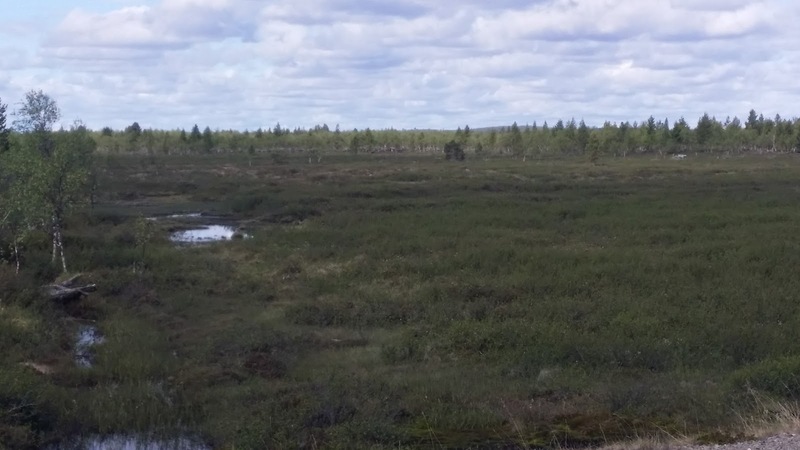 After this there would have been no sense in finding a suitable spot for wild camping, so I rode directly to Ounaskoski Cmaping. 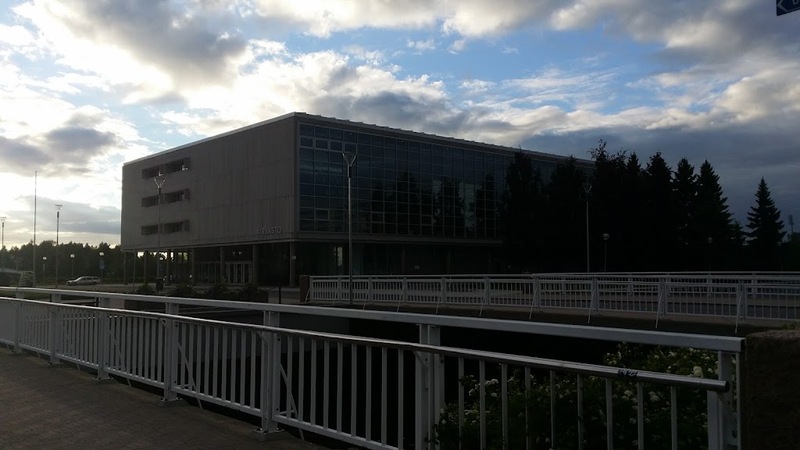 The evening was gorgeous! 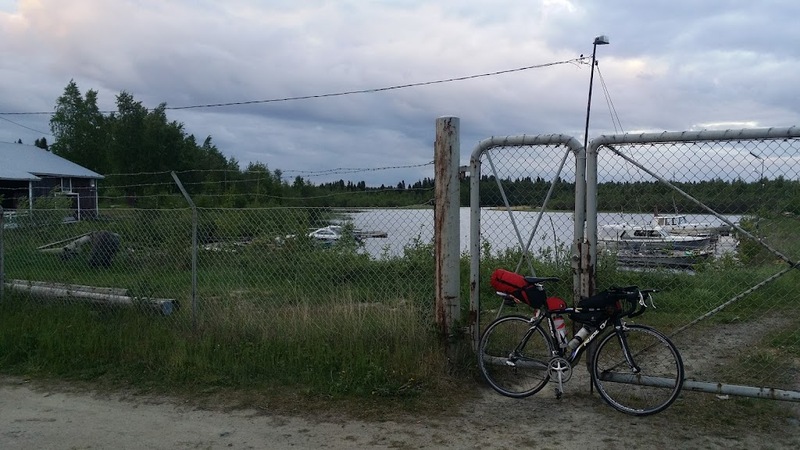 At Ounaskoski Camping I had to pay for a tent spot, although I didn't really have a tent. 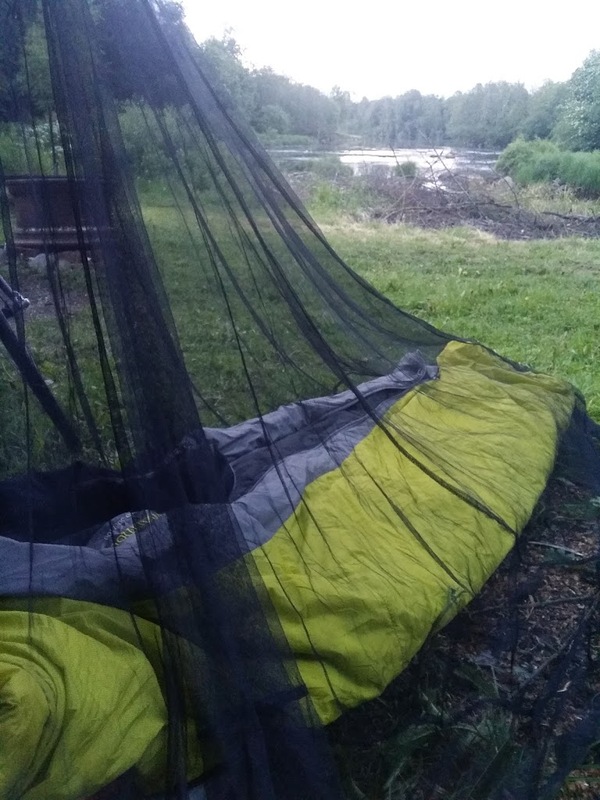 A member of staff helped me find a place for my bug net but all of the trees were tall pines, making it difficult to hang the net. 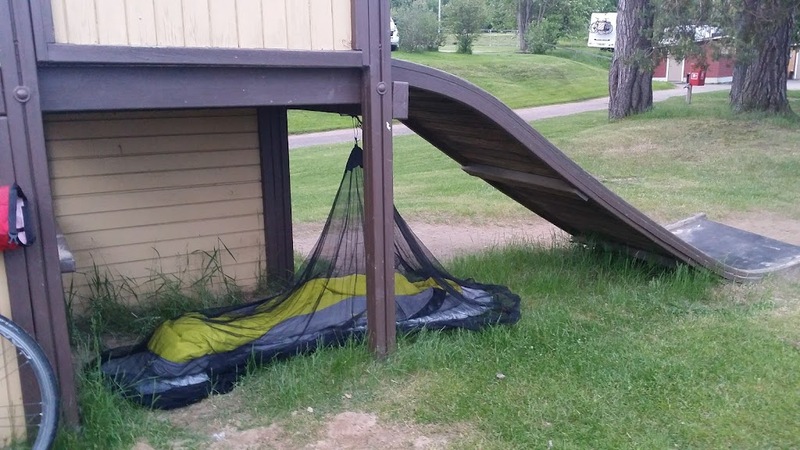 Looking around I spotted a children's playground and it looked like the slide there would form a fantastic shelter. The staff member told me it was fine by him. Perfect! That day's distance was just 218 km. 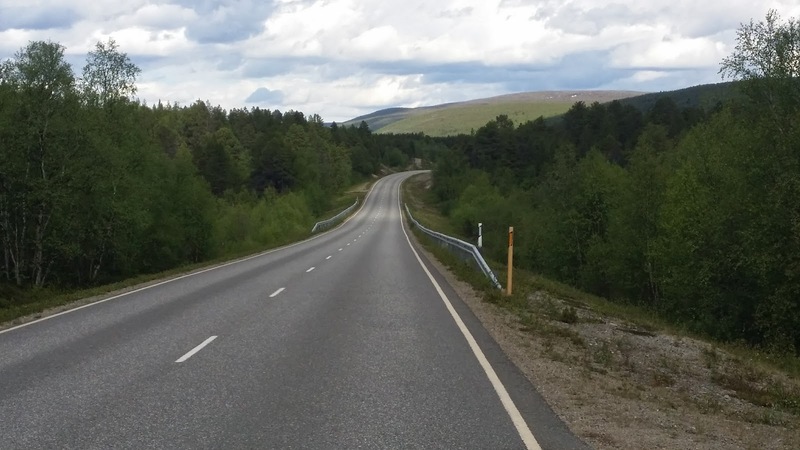 The day had been a tough one, but my total distance was 990 km and unless something disastrous happened, I would be able to reach Nuorgam within my schedule. I had a pretty good night of sleep, and started my morning routine early enough. It was only a matter of finding my morning coffee again. A bit of riding on the E75 and I bumped into a Citymarket and an R-kioski with fresh coffee but nothing proper to eat. The staff told me the days deliveries were not in yet. So my timing was a bit bad, and I still felt somewhat shattered. My other Achilles tendon had started to show signs of pain as well. I loaded both sides with an ample coating of pain gel and took another double dose of pain killers, and left the shoe straps quite loose. Starting the day was all about slowish grinding but as the hours passed things got better. 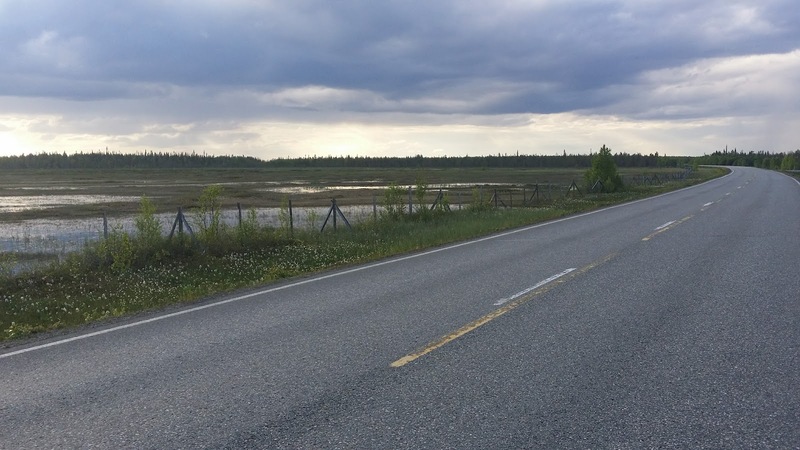 It was still really raw going, but my next longer pause would be at Sodankylä. Once again I made my mind work with its full force, focusing on the lighter side of things. The weather was good, the bike was ticking like a clock etc. 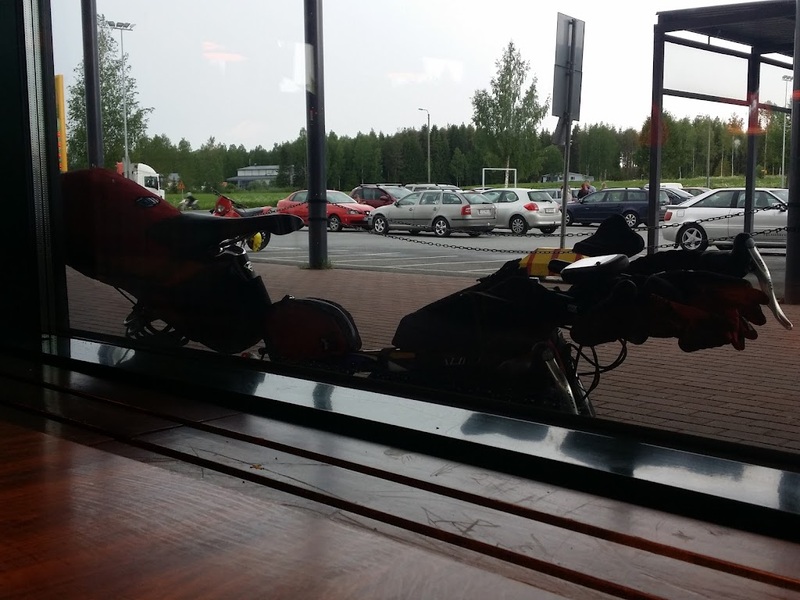 Between Rovaniemi and Sonankylä I had a couple of short breaks, first at a small shop for some better breakfast and later on a cafe. It was on this stage that I came across the first bike tourist on the entire trip. 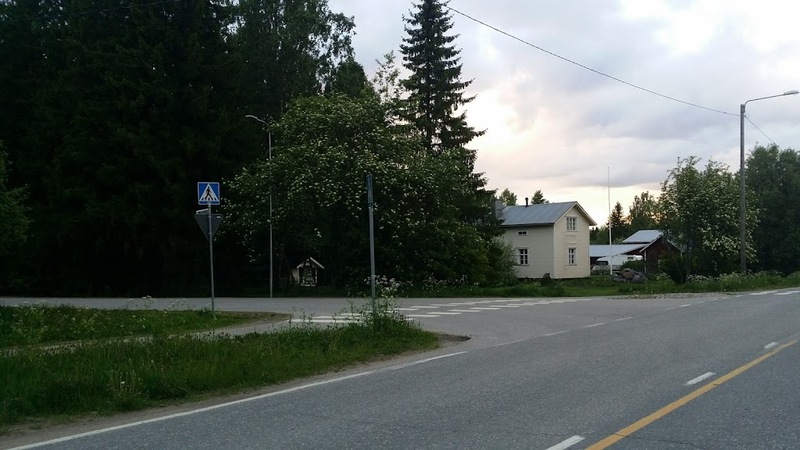 The crossroads to Pyhä-Luosto. A familiar, great place from last winter! 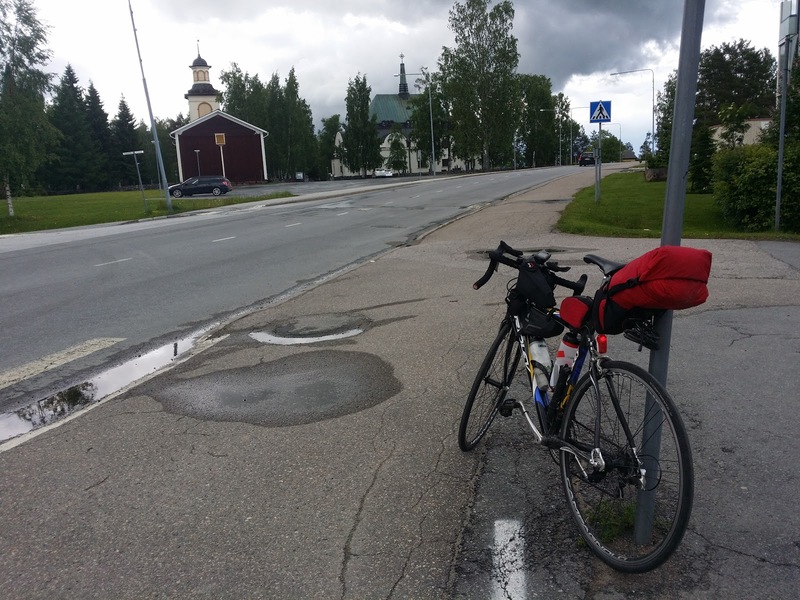 As I reached Sodankylä I immediately headed for the pharmacy as I was running low on pain killers. I had enough pain gel left. I wanted to eat something other than pizza or hamburgers so I went to a small restaurant called Päivin Kammari. I ordered salmon soup and hooked up my phone charger and power bank for charging. As I was eating, a rain front rolled in. It wasn't massive but at times the rain was quite intense and it kept raining for at least an hour. 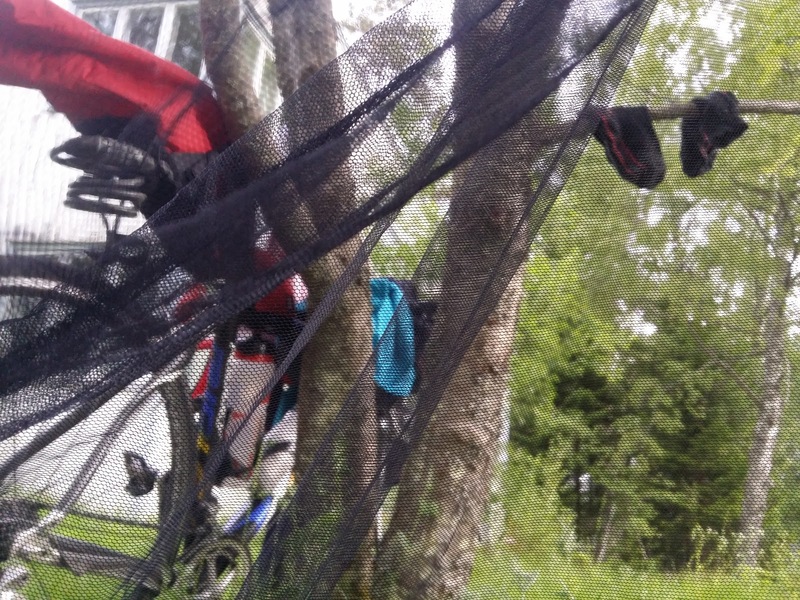 I stretched my stay as I didn't see sense in going for another bath on my bike now that my clothes were dry. The clock was ticking mercilessy, however, and my thoughts revolved around the following night. 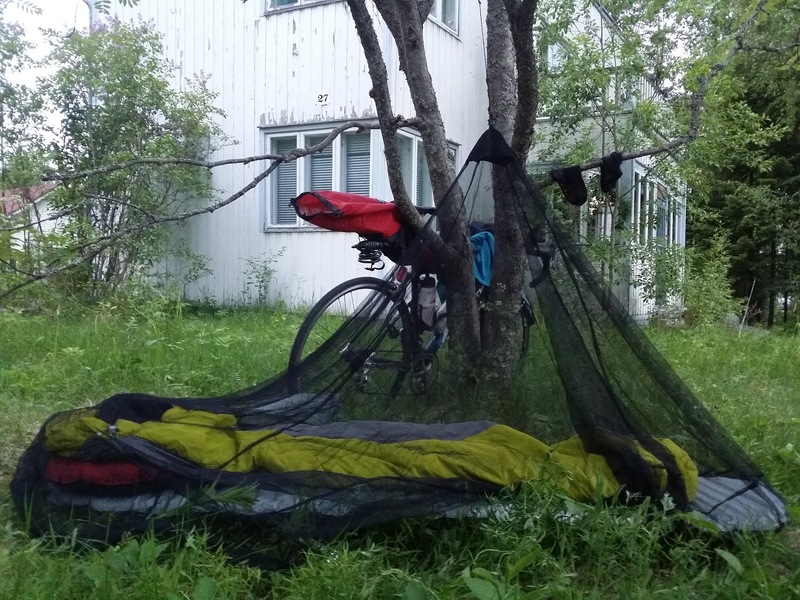 When the rain would stop, I would ride at least to Saariselkä and find a spot to sleep in. 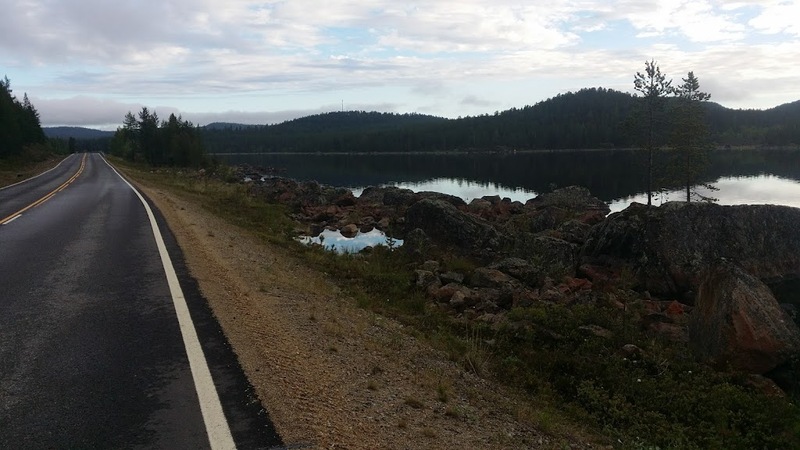 On this break i was feeling great, and I knew that the best part of the ride was ahead of me, Northern Lappland at its best. 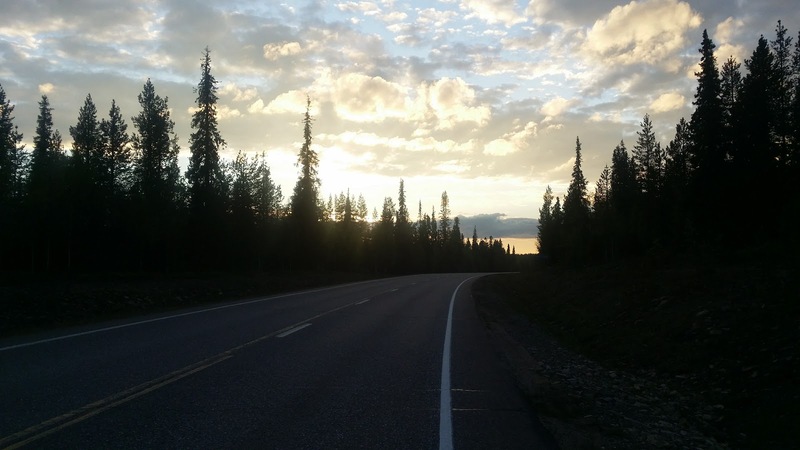 The final night spent on the road was waiting, and I didn't have to hold back at all any more. I applied more pain gel and took pain killers. 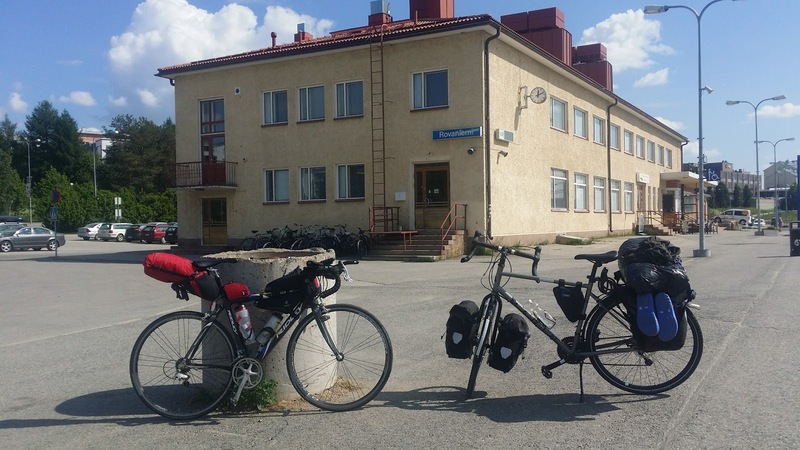 Before leaving I hooked up with my friend Matti on Messenger and he listed the services that I would be able to use on the remaining route, complete with opening hours. Finally the rain stopped and I got back on the bike. And I really enjoyed riding. Finally things started to roll properly! And at the same time the scenery turned into wilderness! At Peurasuvanto I met with another slow moving rain area. I stopped at a camping ground for a while to wait the rain off. A woman was leaving the area and asked if I needed help. I told her I'm just waiting for the rain to pass and told what sort of a ride I was on. 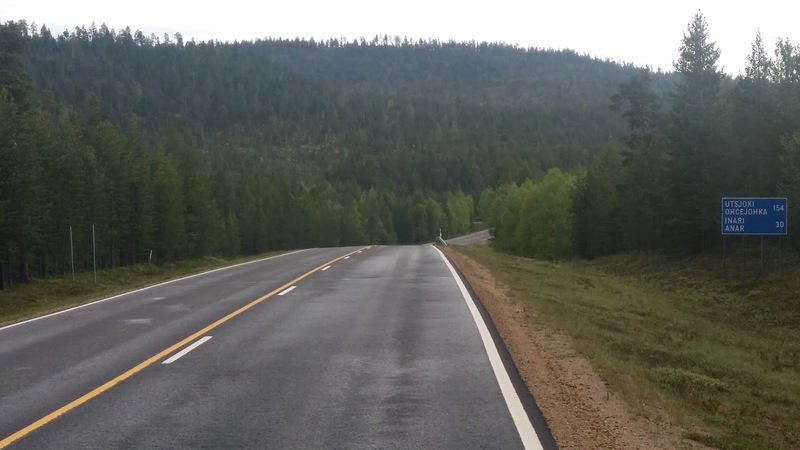 The rain area was massive enough to keep the roads wet for 30 – 40 km of riding, making my legs and feet wet again. But I didn't let that bother me, as the evening was beautiful and I felt great on the bike. I started playing music in my head, as I naturally didn't have an MP3 player with me, and I don't think you ever should. Using one would have been extremely dangerous with the traffic I'd faced. During the night I kept going through the ear worm By Anna Puu called ”I just need one more night”. A catchy melody, definitely, but the lyrics matched my situation: I just needed one more night as well. 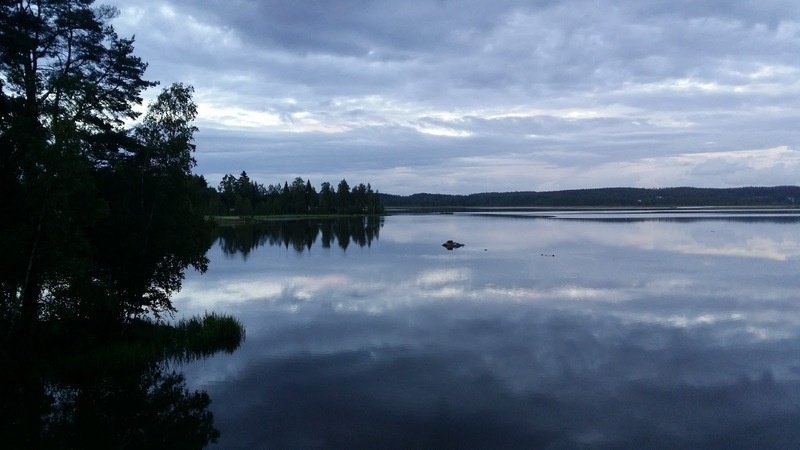 I arrived to Saariselkä feeling quite strong, at about 1 or 2 AM. I headed for Hotel Riekkolinna which has 24h reception. The guy working there was very kind and allowed me to do some basic maintenance under their roof. I naturally bought snacks and drinks, as they had potato chips, chocolate and Coke to offer. The man told me to take my shoes and socks to the drying booth, which was luxury as my wet feet were actually getting a bit cold. It was nice talking to this guy on night duty. I wasn't in a hurry at Saariselkä as Ivalo and Inari weren't far away any more and I preferred to arrive at Inari at a time when the local gas station was open, to get breakfast and coffee. At this point I wasn't even tired. The plan was clear for the rest of the trip: I would ride all the way to Nuorgam without sleeping in between! 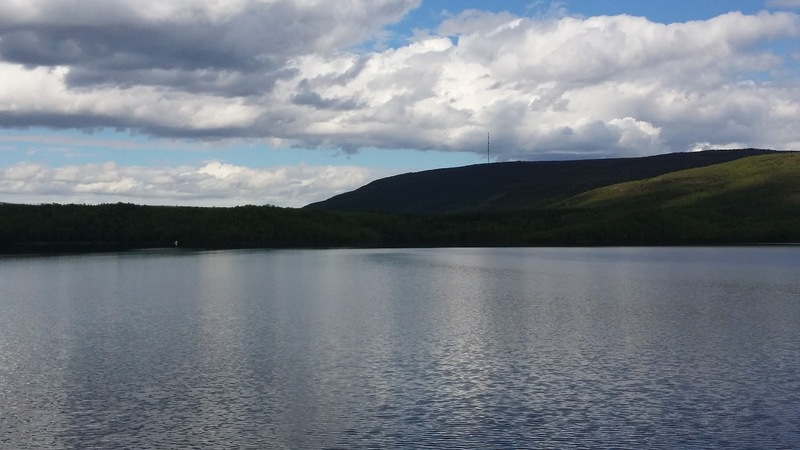 As I left Saariselkä, the weather was beautiful but a bit chilly. 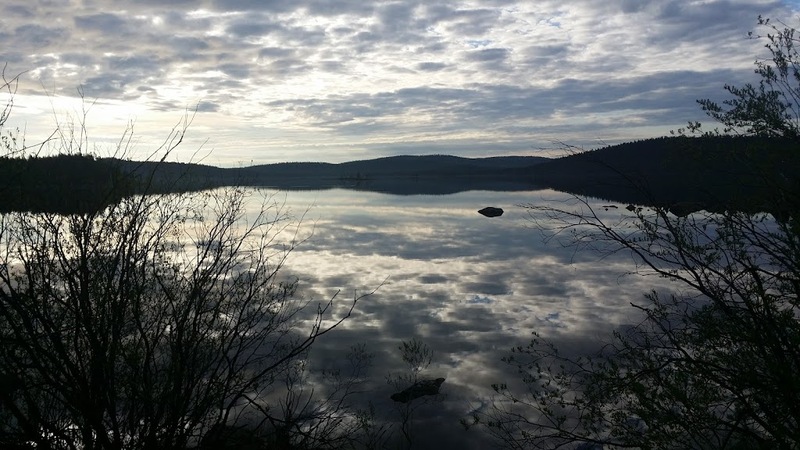 Closing in on Inari the lake views were extremely beautiful and wild. 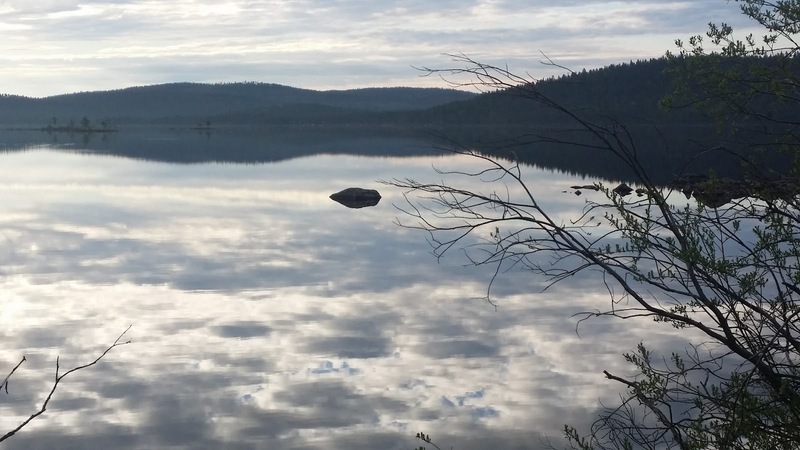 The nature in this part of Lappland is not just pretty. It's really, really beautiful and magnificent. 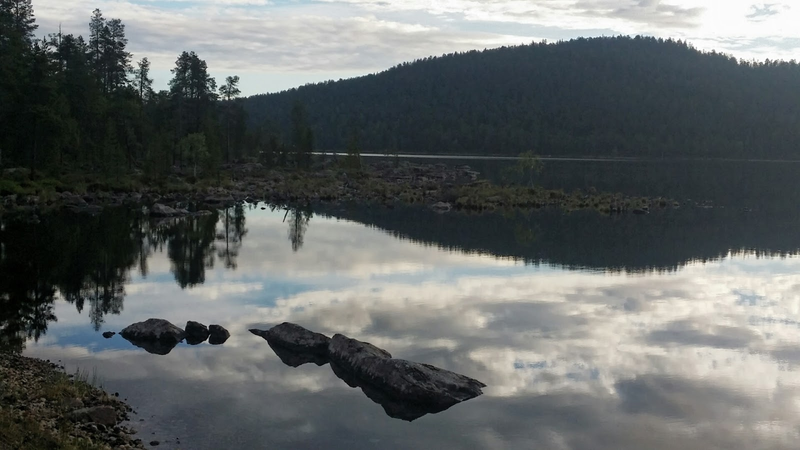 I arrived in Inari just as the local little store opened its doors. I got a set of the old familiar snacks and topped it off with some jerky and beer bangers. 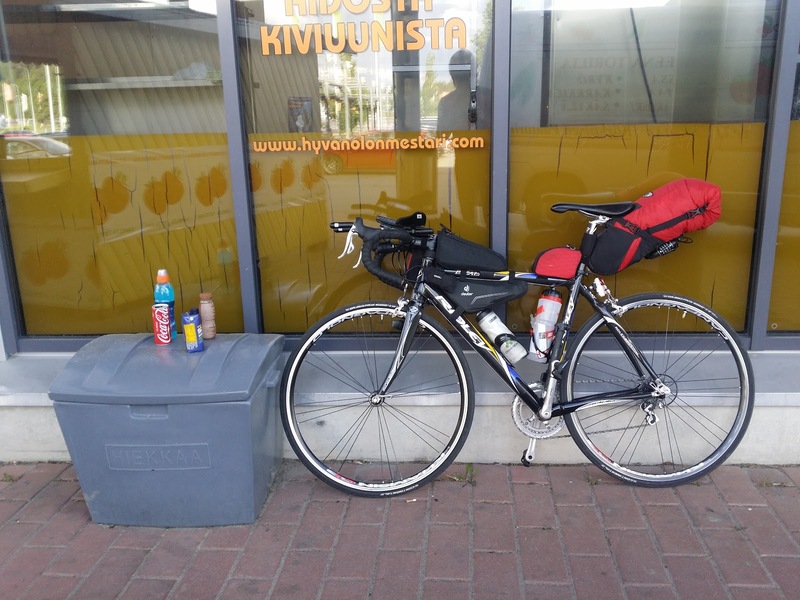 Next I enjoyed a morning coffee and breakfast at a Neste gas station. This was the first time sleep deprivation started to have an effect and I dozed off sitting at the table. Back to the bike. 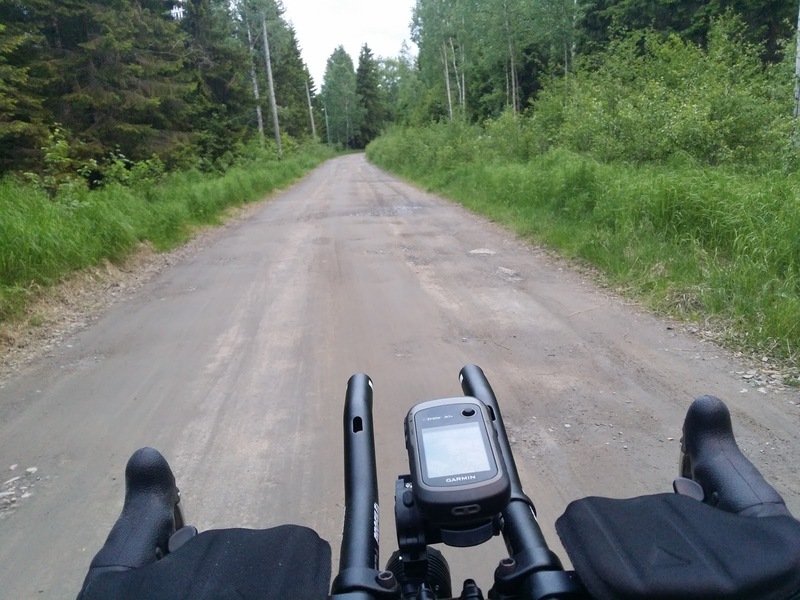 It was easy enough to start off again, as I just couldn't wait to ride through the Kaldoaivi wilderness! And finally I was close to Kaldoaivi! At this point my internal jukebox was playing for instance the Shamen and Move Any Mountain. 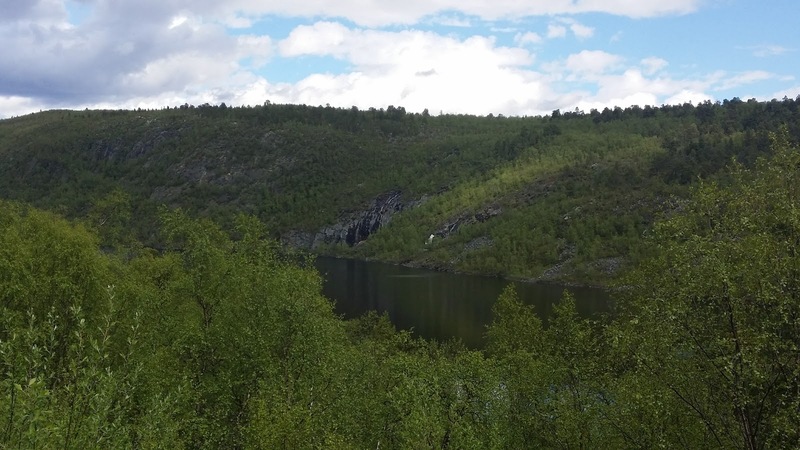 In Kaldoaivi (and on the left side the Kevo nature reserve, with the Paistunturi wilderness further in the scene) I cought up with a German woman on a bike tour. 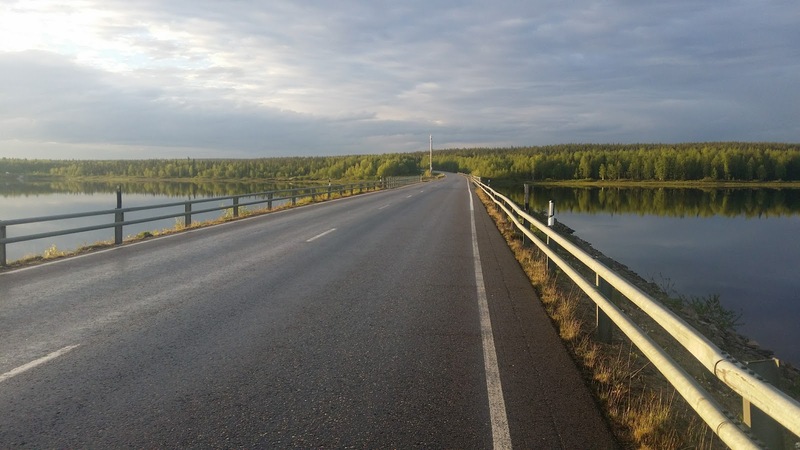 She seemed a bit surprised to hear I had started from Hanko the passed Sunday and had been going non-stop from Rovaniemi and would not stop until Nuorgam. 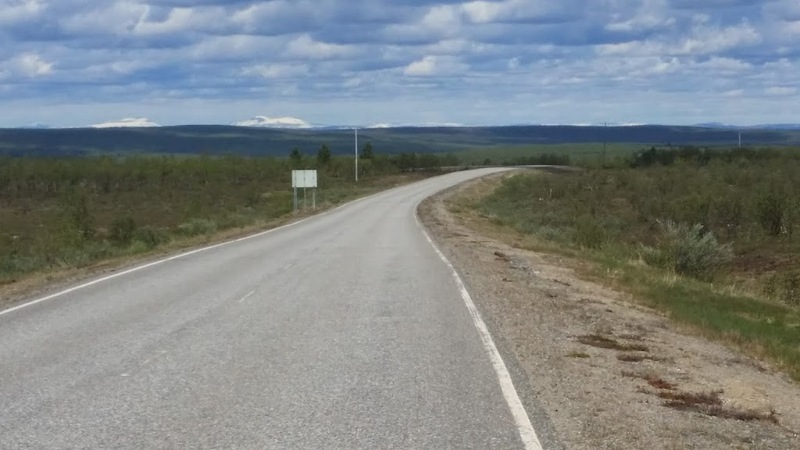 Her next stop was Utsjoki. I told her I would have a break there so perhaps we would meet again. 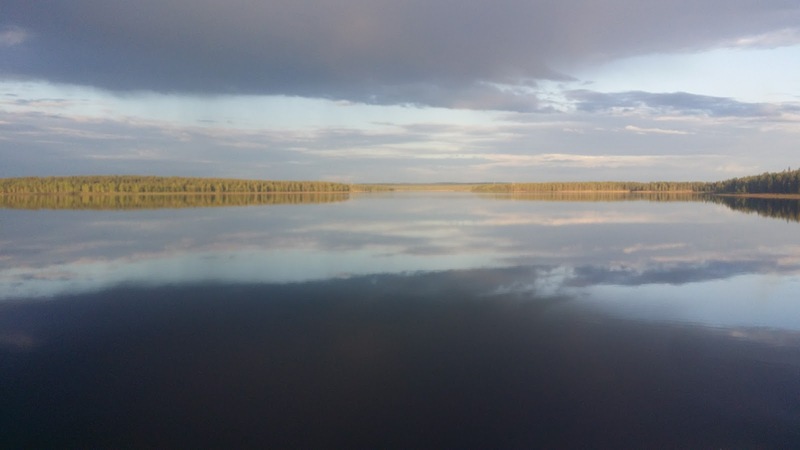 By the time I reached Kaldoaivi I was feeling simply euphoric and my smile was too big for my face to handle! 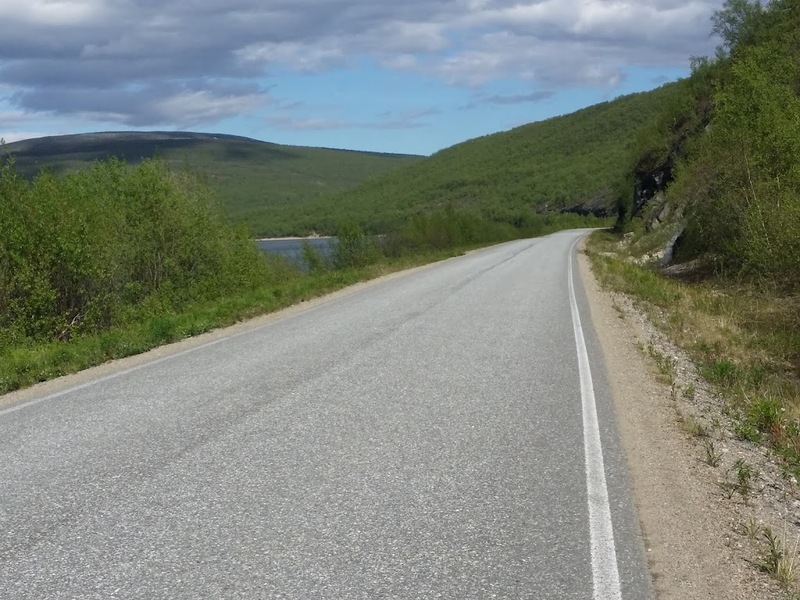 As I continued towards Utsjoki the road offered me more downhills and riding was easy. Too easy, in fact, a sign of sleep deprivation getting down to its old tricks. 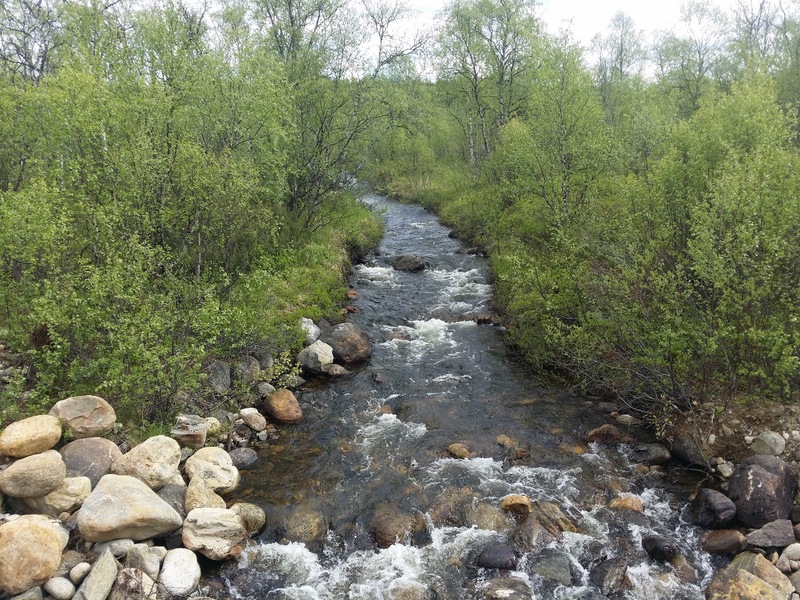 During one descent I felt so tired that I stopped at a bush next to the stream and dozed off with the calming sounds of the stream ringing in my ears. This was, however, not the time to switch off so I got up again. Of the ultra distance races I've read about and seen documentaries of, the Barkley Marathons has of course made a huge impression. In the short documentary film Barkley 100 Jared Campbell, to be three-time winner of the race, is seen tying the laces of his shoes with his body language full of determination. As I was riding, I kept repeating his words ”Just a bit more, and then it's done”. 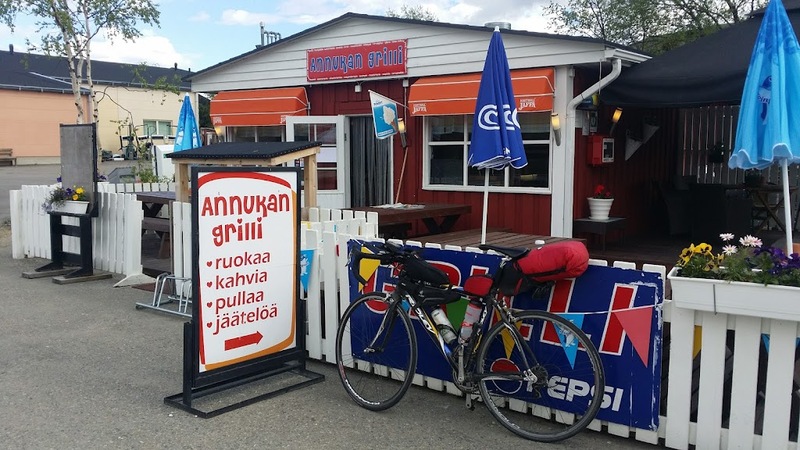 Arriving in Utsjoki I stopped at Annukka's Grill and ate a hamburger and drank a Coke. 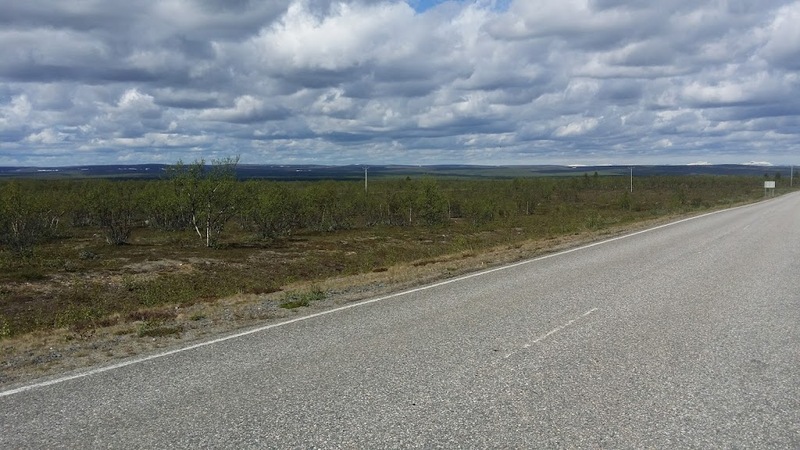 I was just about 45 km away from the Nuorgam border. Just a touch beyond my bike commute distance, so it shouldn't be bad, right? 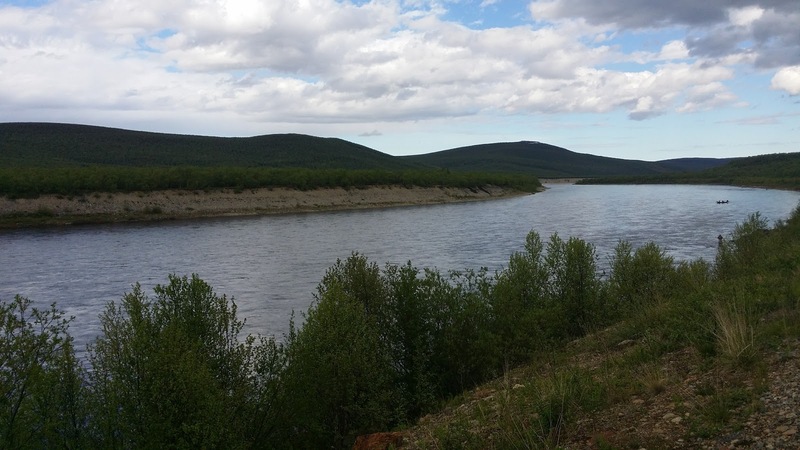 Matti sent me a message saying: ”enjoy it, the route follows the river Teno”. until the road changed direction, and so did the wind. Riding along the Tenojoki and in the mountain passes the wind was hard and completely against me. For 10 km I rode at an easier pace, with the result I started to drift off, big time. In addition to the strong headwind it of course started to rain as well. On the left side of the road was a small hut where someone was selling fishing licenses. I rode to the hut, took shelter from the wind by its wall and closed my eyes. I didn't really fall asleep but had a small rest. But I still had 35 km left! I couldn't allow myself to switch off here! A dramatic finale was needed, once again. It felt like the wind and rain were gathering momentum. I got up. Now it was all about trying to ride towards the finish line, to the end. 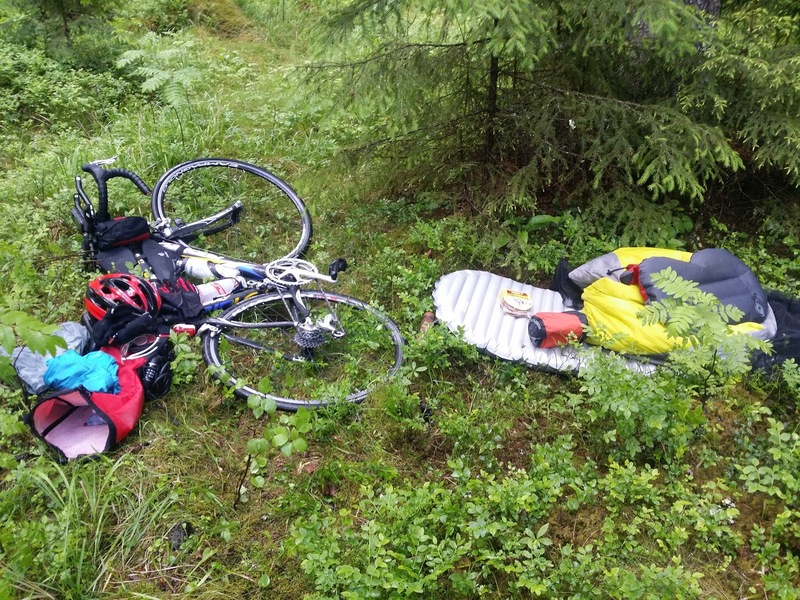 My only option was to ride as fast as I could, otherwise I would fall asleep and wake up at the bottom of a ditch. I managed to get my adrenaline levels up and rode most of the way off the saddle, blasting away. The route was a series of up and down hills. On occasions I reminesced over the final scene in the movie about the bridge over the river Kwai, where William Holden fights to his last breath, even though he has been shot. ”Fight! Till the end!” I kept telling myself. The last kilometers really started to feel like torture, as I never seemed to reach the border post. But of course I would, just a couple of more kilometers. The final stretch was all uphill, in a head wind that by now was feeling quite infernal. 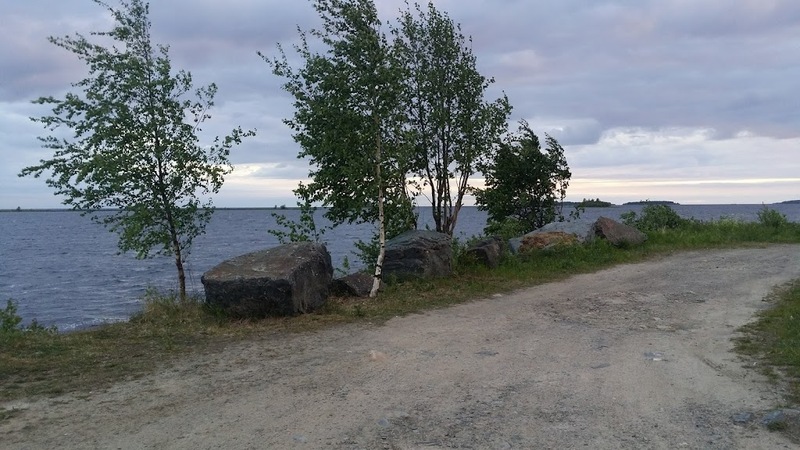 Then I saw the border and the famous rock with a plate ”The most Northern point of Finland” and ”The most Northern Point of the European Union”. It was hard to believe! Is this really it?! Yes it is!! I was taken over by emotions and tears were running down my eyes as I rode the last 10 – 20 meters. I slammed by bike seat with my fist and lifted my hand up. There was no-one around. A bit later a couple of families arrived in two cars and they took photos of each other at the post. The father of the last of these families took this photo. I felt a bit dizzy and very fuzzy, and unreal, to be honest. 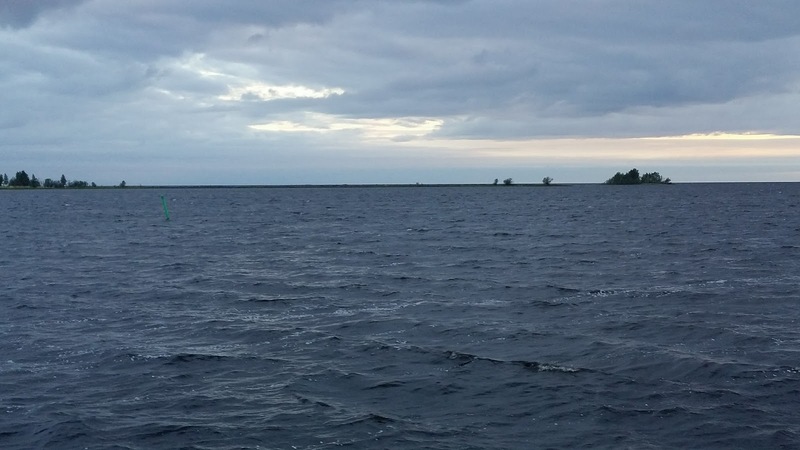 The rain stopped and I reported in social media: ”Destination reached and mission accomplished!”. My total distance was a touch under 1500 km and it had taken me 5 days and about 3.5 hours. 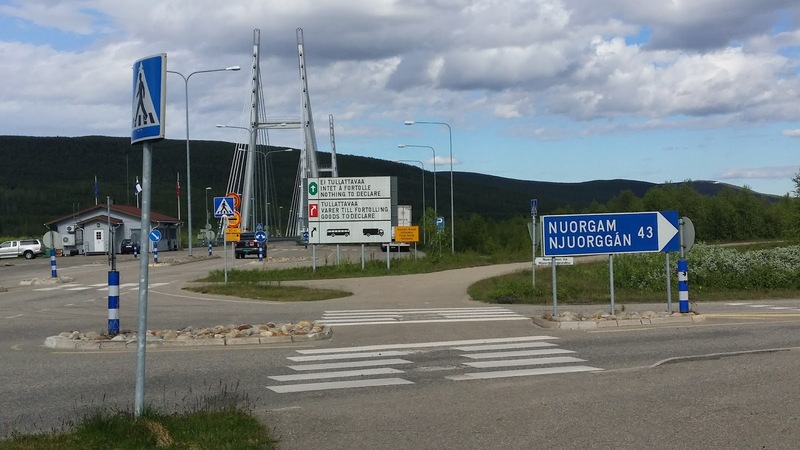 I wandered around Nuorgam for a while and bought something to eat at the village store. I set up camp in the brush, but close enough to the road that I would be near the bus stop. 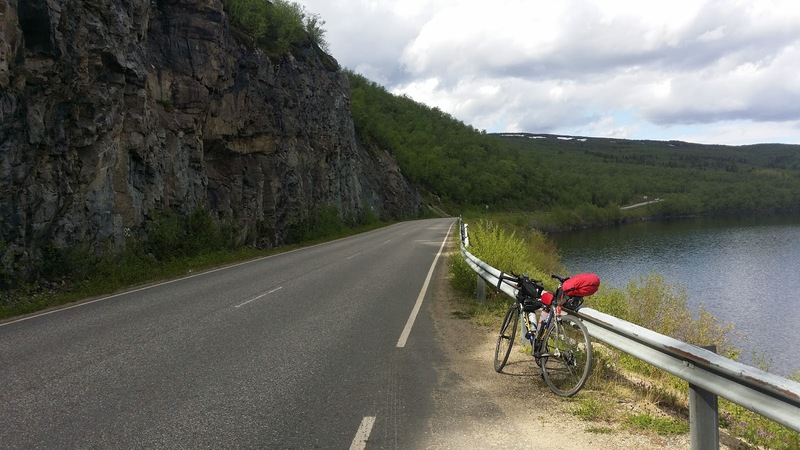 Had this trip taken much less than 5 days and nights, I could have taken another 30 km ride to reach the Arctic ocean shore in Norway. I got a couple of hours of sleep, waking up well before the bus arrived, around 3 AM. A 67-year old female bike tourist was also waiting for the bus. She had been making day trips in Norway. 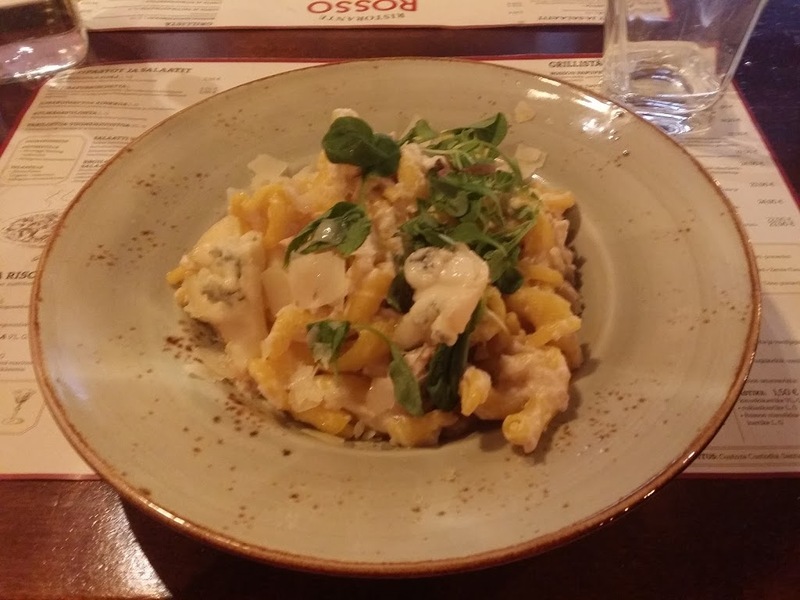 We ended up talking about surprisingly deep matters regarding the world and human nature. During the bus ride I ended up feeling like I did back in 2015 on my way back to Anchorage from McGrath after the ITI race, with the other ITI competitors. Instead of jet engines, this time the low and powerful noise of a bus engine seemed to amplify the glory of heading back home, as I was seeing the route from the other direction much faster than I had ridden my bike. That feeling is pretty much impossible to describe, but I can tell you it is marvellous. Next we headed to the shore of Ounasjoki. Riku was clearly a fine young man with highly respectable values. I showed him some pictures of my Alaskan excursion and I think they impressed him quite a bit. I told him he'll get there if he feels like it and takes it as a personal goal. In the evening I went down town to enjoy the city before the train left, and bumped into Julian Amorrich, a man I had met in the Rovaniemi 150 races. On the train I got some more cyclist company, as a very peculiar bike tourist took the same train to Oulu. An interesting purist, who was fun to talk with. It was close to midnight again, and I thought I might finally fall asleep. It's quite uncomfortable on a train seat, but I went into a sort of a fetal position and tried anyway. Some whacky guy sitting behind me kept playing a pitiful excuse of a song on repeat. Thankfully he stopped some time into the night. I was half-dozing until Seinäjoki and I was woken up by the noise made by people heading home from the Provinssirock festival. I had forgotten about the festival, and the fact it had come to an end just as I was making my way back home. God damnit, I thought, believing this would be an extreme trip in the true meaning of the word. A young lady who was actually not intoxicated at all sat beside me. The rest of the bunch were, and most of them were much older than her. Well, all I could do was grit my teeth and suffer. Thankfully in less than an hour the noisy bunch had fallen asleep. 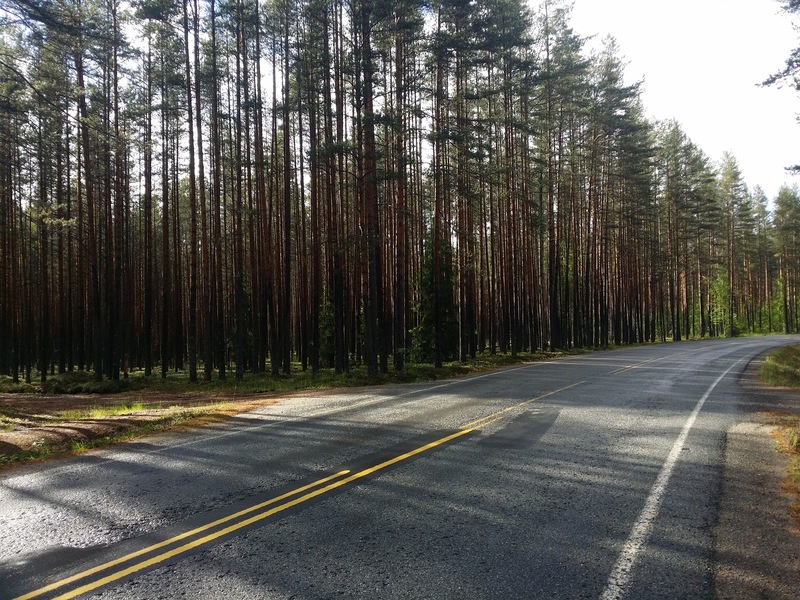 Trans Finlandia turned out to be a vivid adventure with a bit more adversity than I had expected. As always, overcoming adversity feels marvellous. My faith was, however, not really tested at any stage. I was actually extremely determined, as this ride had been a dream of mine for a long time. 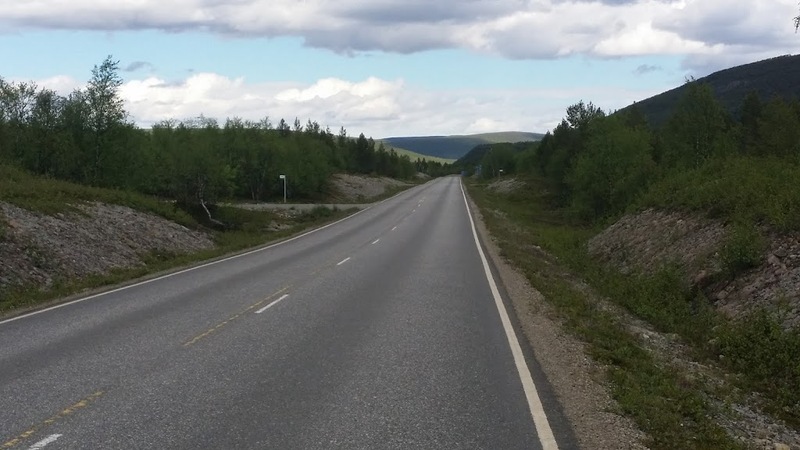 The grand 505 km finale from Rovaniemi to Nuorgam, once again proved the fact that on a bike, testing my limits, I am exactly the person I want to be. And although it might seem a bit crazy, I find it very easy and natural to be in that situation. During the trip I was naturally helped by my dear wife, who has inspired me by showing her strength in fighting through her health problems. I also thank everyone who cheered me on in social media! To end the story, here's a bit of ”what ifs”. Had I been in better physical shape, and with nicer weather, I believe I would have been able to reach the finish line at least 12 to 18 hours earlier. But this was also an adventure, not just performance. It gave another big dose of confidence to carry on towards ITI and Nome.